I spent the best four yours of my life in Pittsurgh. 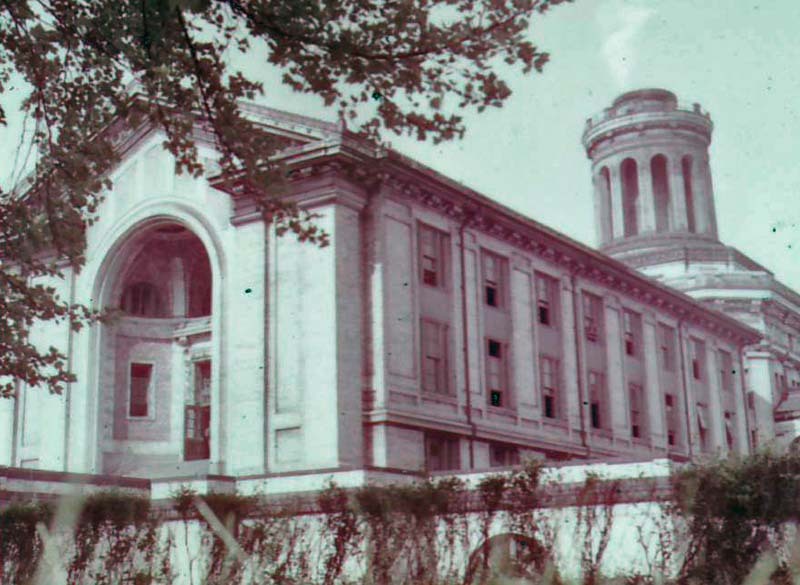 I was an undergraduate student at the Carnegie Institute of Technology. 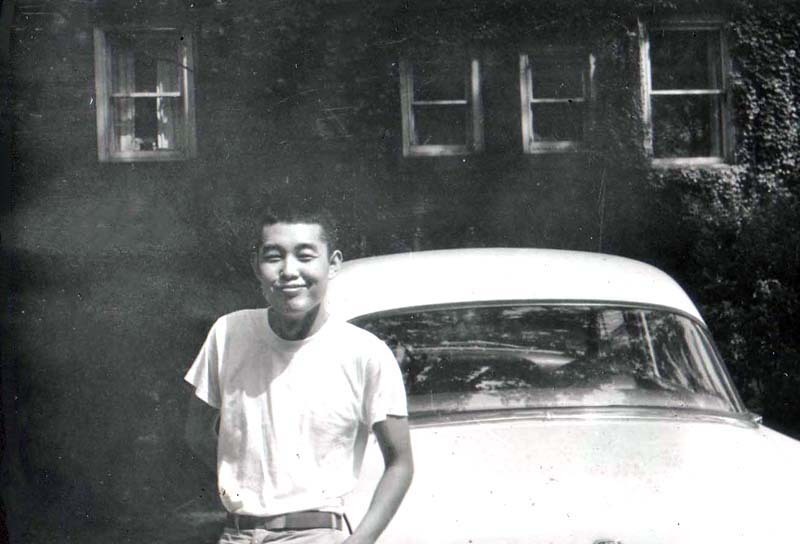 I came to the United States from Korea in 1954 to become a freshman at the Carnegie Institute of Technology in Pittsburgh. 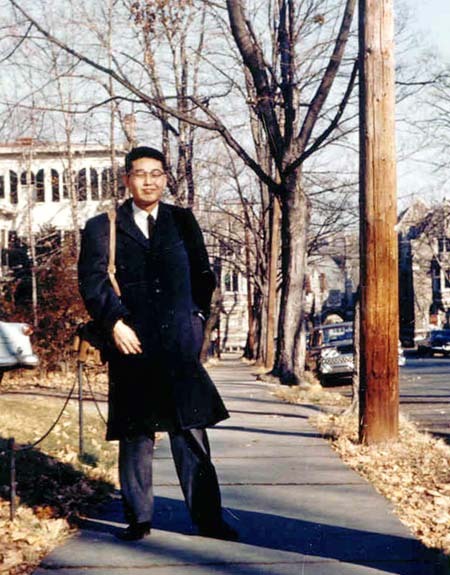 After my graduation in 1958, I went to Princeton University to get my PhD degree in 1961. 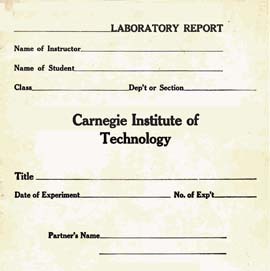 I was able to complete my graduate program in three years thanks to the solid education I received from Carnegie Tech. 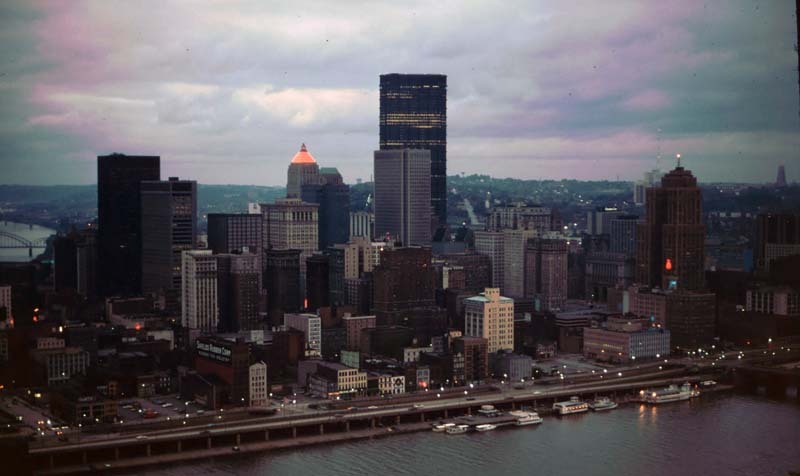 During my time (1954-58), Pittsburgh was a steel city set up by Andrew Carnegie from Scotland. 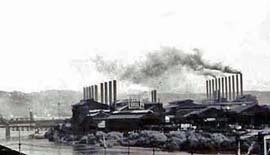 This Jones and Laughlin steel plant was within ten kilometers from the city center. Let us look at some other photos. 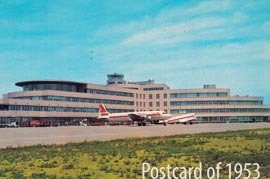 Pittsburgh International Airport was called the Greater Pittsburgh Airport until the first British Air flight came from London in 1985. 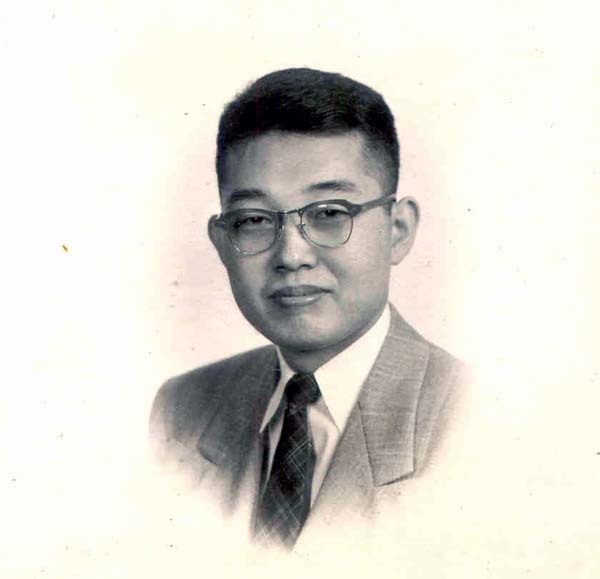 When I came to Pittsburgh from Korea on September 3, 1954, I arrived at the old terminal looking like this. 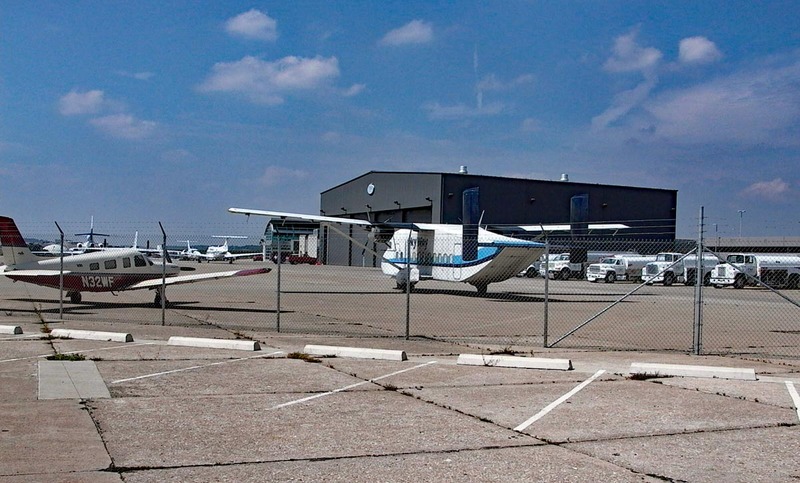 This building was completely torn down, and a new terminal buildin was built at the other end of the major runway. 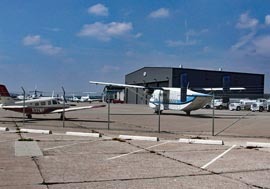 The old parking area is now used for many privste airplanes. I was there on September 3, 2004, exactly 50 years after my first arrival date, and I took some photos there. 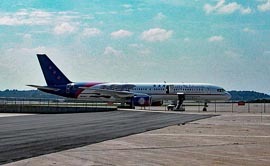 Kerry-Edward plane was also there. It was an election year. John Kerry was the presidential candidate from the Democratic Party running against George W. Bush. His running mate was John Edward. 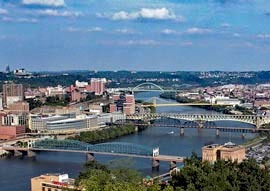 Why Pittsburgh? Kerry wife is Teresa Heinz, super-rich heiress to the Heinz company based in Pittsburgh. 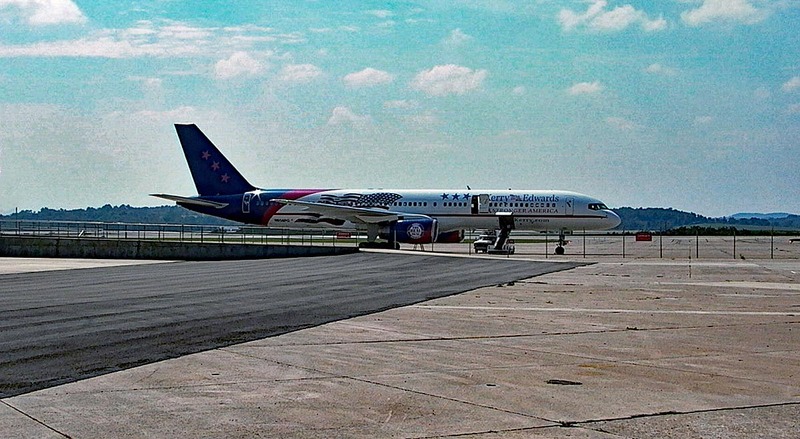 New Terminal. When I went to the airport in 2004, I went to the new terminal first, and found the environment so strange that I went to the information booth to ask whether I was at the right place. At this booth was this lady who came to Pittsburgh from Germany in 1952, two years before I did. We congratulated each other and produced this photo. 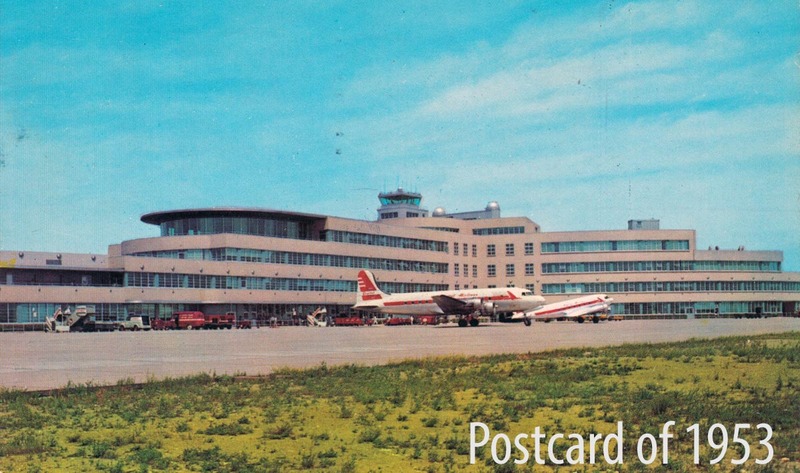 With this new building, the airport is now called the "Pittsburgh International Airport." 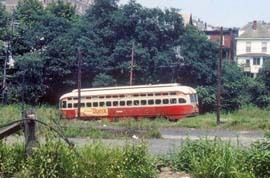 One of the Street Cars in those good old days. Bush Hotel in Seattle. 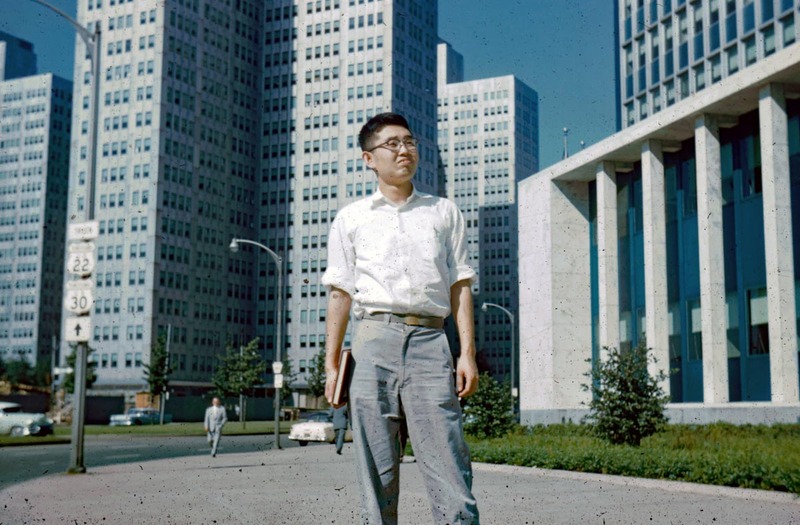 On my way from Seoul to Pittsburgh in 1954, I had to stay at two hotels. One was the Shoto Hotel in Tokyo, and the other was the Bush Hotel in Seattle. 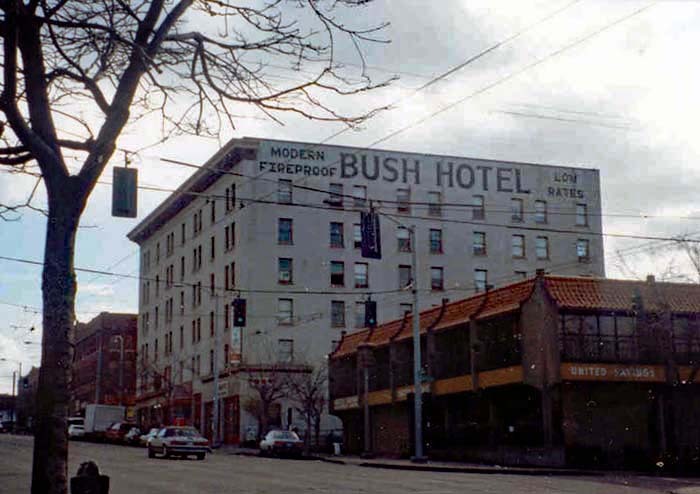 In 1995, I was fortunate enough to visit the Bush Hotel in Seattle on Jackson Street. The building was still solid, and the hotel lobby was still well organized. I used this elevator to go to my room on the third floor. The round clock-like floor indicator was still operational. This hotel was originally built and owned a Japanese American. The word "Bush" in Japanese means warrior or Samurai. Watermelon Bank. After my arrival, I had to open an account at a bank called "Mellon National Bank." I thought it has something to do with delicious melons, but it took me more than fifty years to learn about this bank and its founder. Yet, it is still a watermelon bank to me. Railroad Station. 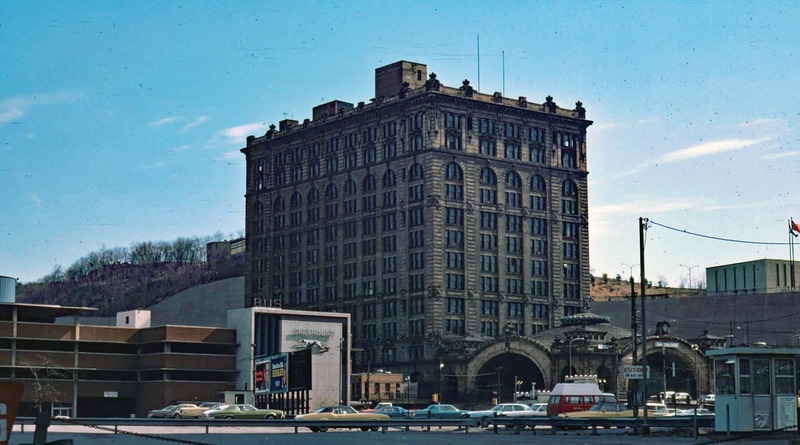 During my time (1954-58), this building was called the Pennsylvania Railroad Station, and more people used railroads than airlines. 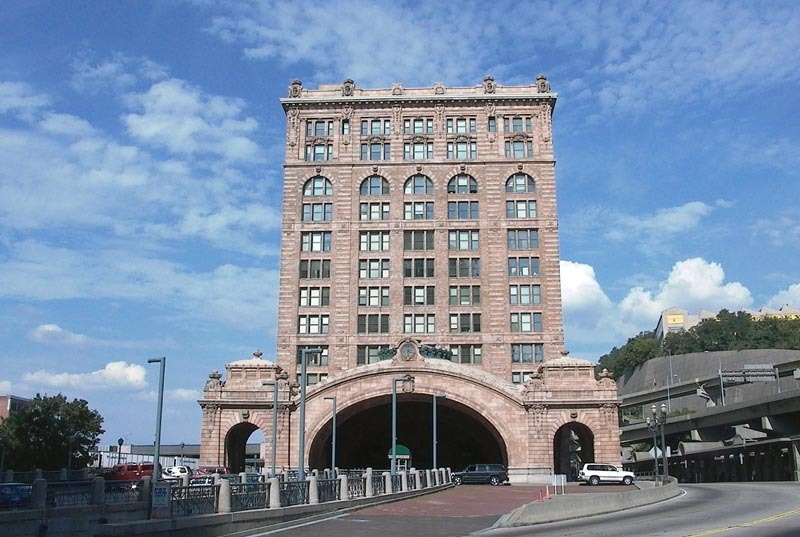 These days, it is an apartment building called The Pennsylvanian, and its ground floor is used for an AMTRAK passenger facilities. I used to come to this station to greet my guests. 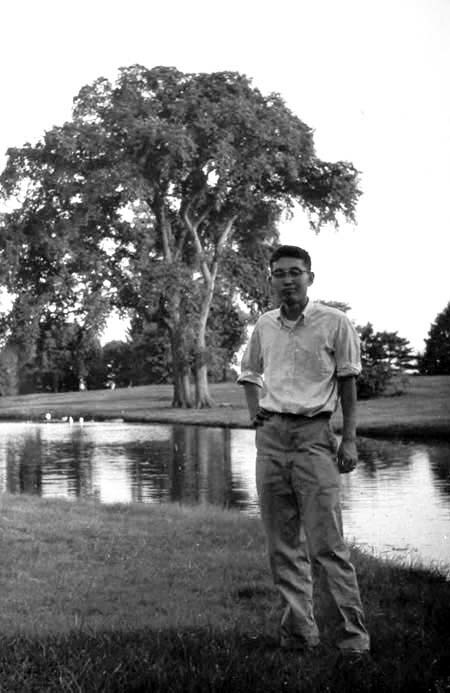 On October 20, 1954, I went to there to greet a very important guest from Korea. See next photo. 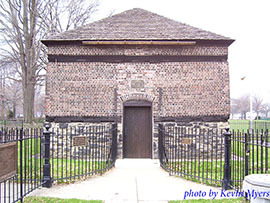 Here is another photo of this building taken in one of the earlier years when it was serving its original purpose. Mr. Kim Won-Kyu was the principal of the high school which I attended in Korea. 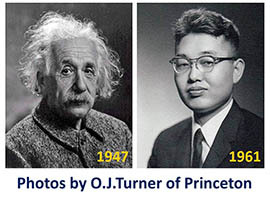 He was a dedicated educator and set many examples for Korea's secondary educational system. 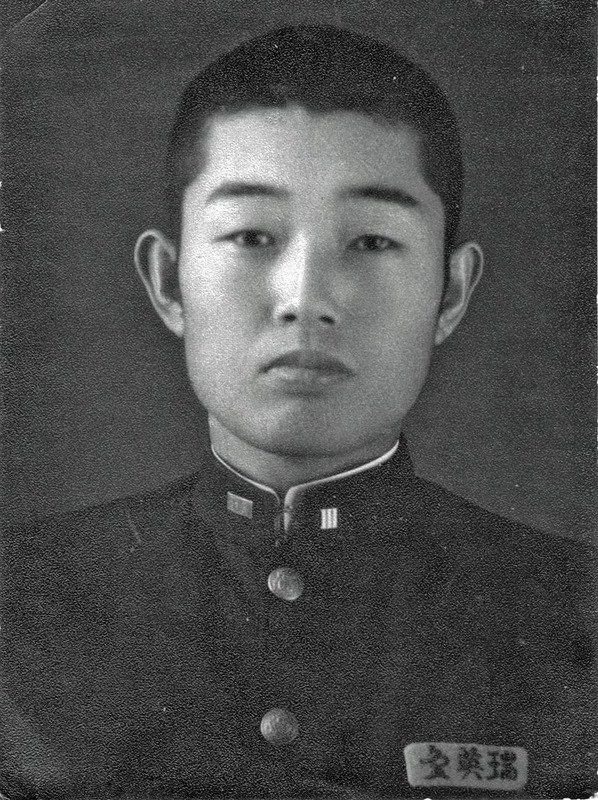 He was eager to send his students to the United States to compete in the world stage. On October 21, 1954. He visited Carnegie Tech to meet with the school officials as well as his former students. 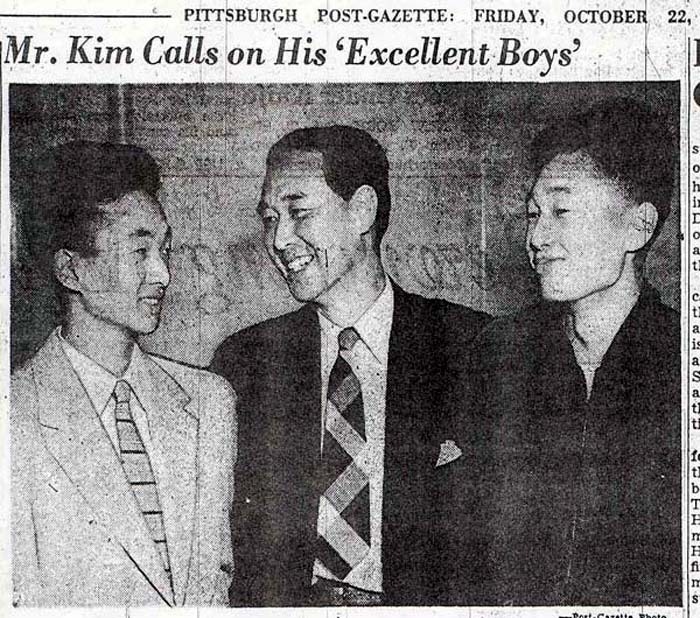 In 1954, it was impossible for Korean high-school principals to visit the United States, but Mr. Kim produced this miracle. This was also a total surprise to American educators. Indeed, his visit was a major news-making event for Pittsburgh newspapers. 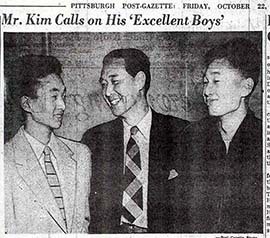 In this photo which appeared in the Pittsburgh Post-Gazette, Mr. Kim Won-Kyu is in the middle. 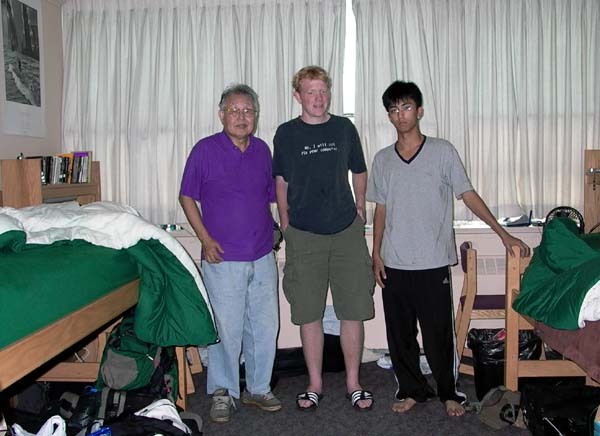 On his left is his former student who was one year ahead of me both at his high school and at Carnegie Tech. 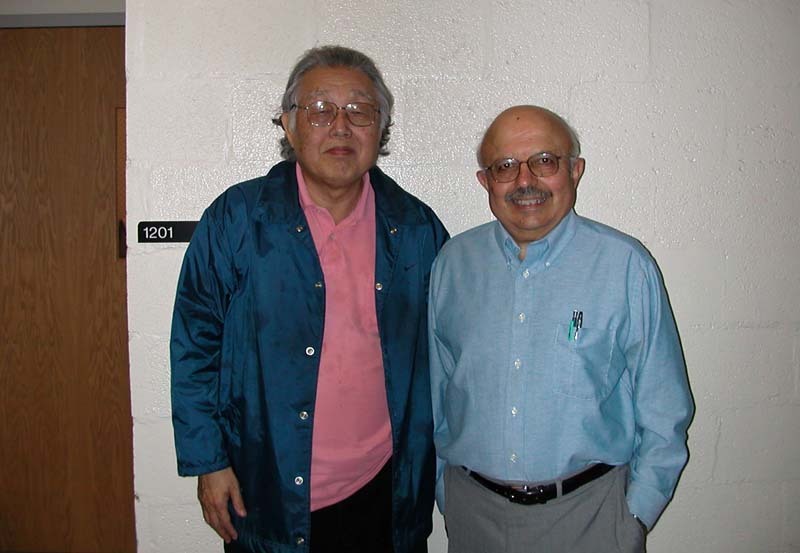 He came to Pittsburgh one year ahead of me, and was very helpful to me during my first year in the United States. 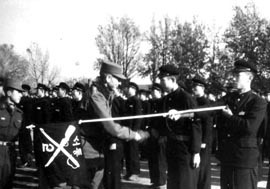 Ten months earlier (December 1953), I was a graduating senior greeting General Maxwell Taylor who visited Mr. Kim's high school in Seoul. Gen. Taylor was the commander of the U.S. Forces in Korea (1953-55), consisting of 350,000 combat-ready American troops. I looked like this in 1954. My American Connections before coming to the United States. Passport Photo. 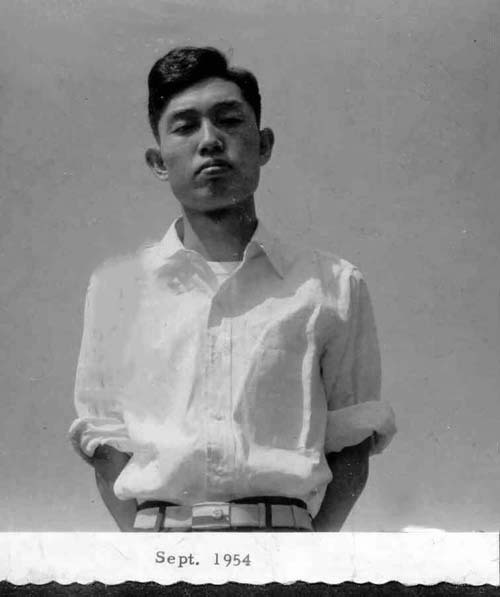 I came to the U.S. with a Korean passport containing this photo taken one month after my high-school graduation. I was still wearing the school uniform. Letters I wrote to one of my friends in Korea during my first three years in Pittsburgh (written in Korean). Here is a moving story he wrote about himself (in Korean). Letter I received from one of my friends, 50 years after graduation. Gone with the Wind. 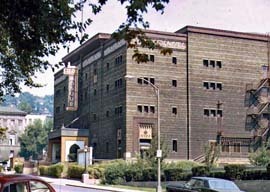 This was the first cinema I saw in the United States. This movie was forbidden in Korea (South) at that time because the Northern army won in the American Civil War. Koreans in the South did not want the North to win. Vivien Leigh acted as Scarlet O'Hara in this classic movie. 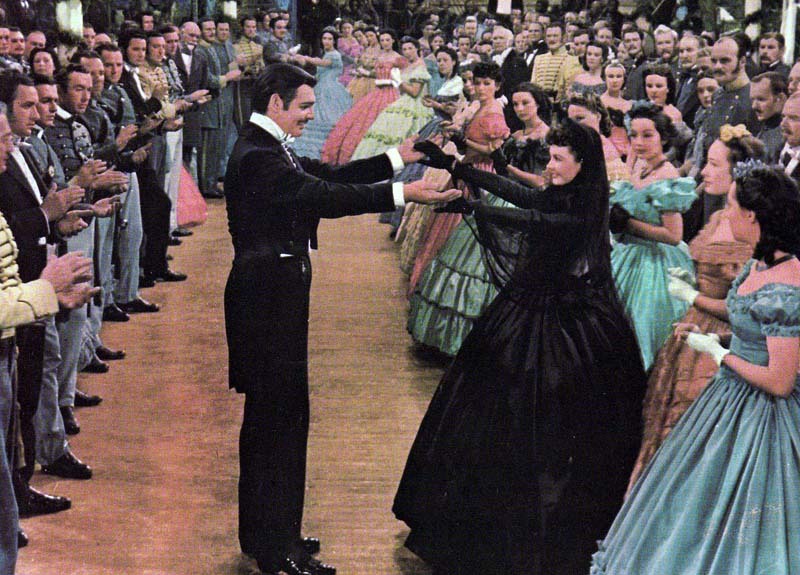 Photos from "The Story of Gone with the Wind" (National Publishers, New York, 1967). 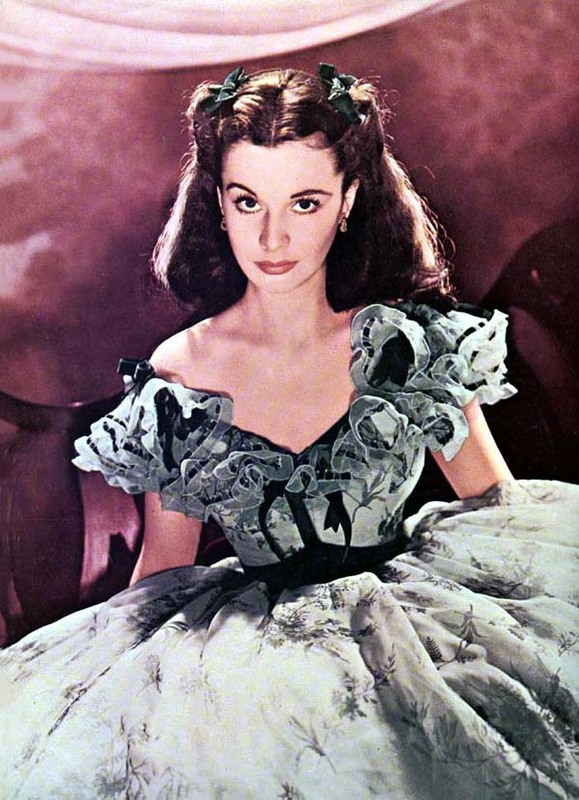 Vivien Leigh is still a popular figure. Here is the Wikipedia page about her. 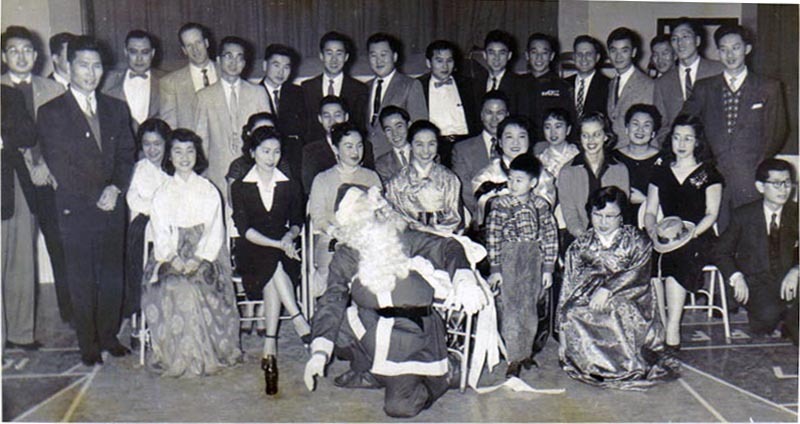 Christmas of 1956. There were not many Koreans in the United States at that time, but there were some in Pittsburgh thanks to the universities and hospitals. They used to get together during major holidays. In September 1954, I looked like this. I was a very skinny boy! One year later, in 1955, I became like this. By 1957, I looked like this. 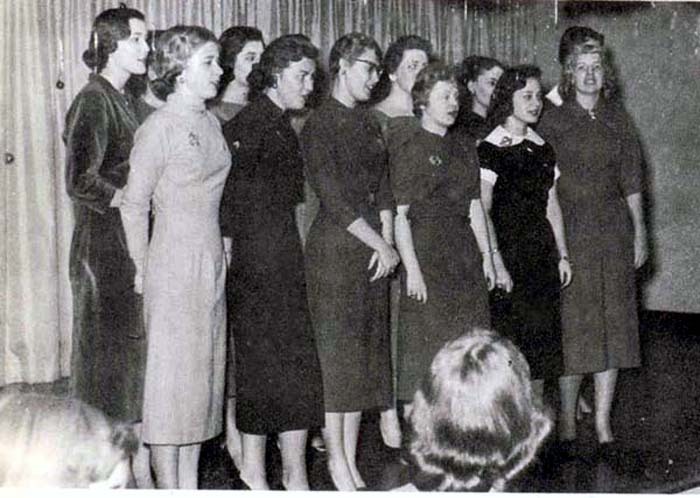 This photo is from my Carnegie Tech class album (Class of 1958). 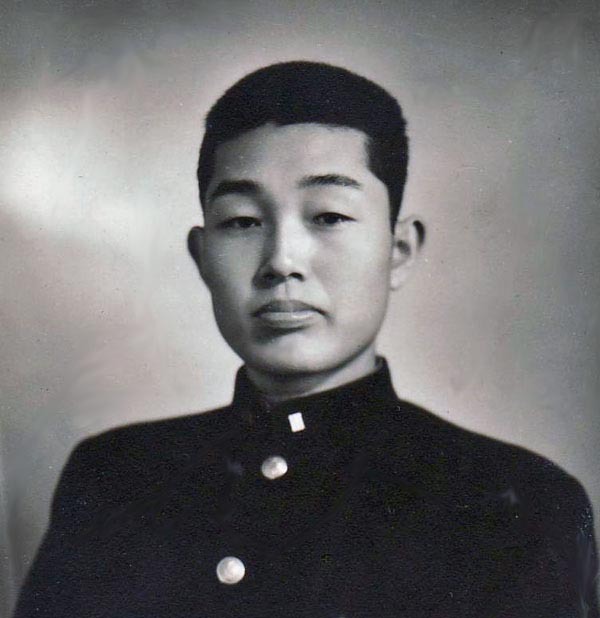 In 1958, right before the graduation. Knees. 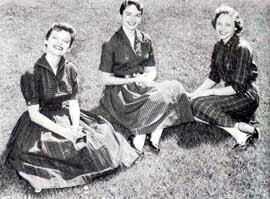 My coed classmates had to hide their knees (1954-58). When they sat down, they had to cover their knees. Cheer leaders also had to cover their knees. I like to see these ladies again! These days (2004), ladies know how to take care of their knees instead of hiding them. 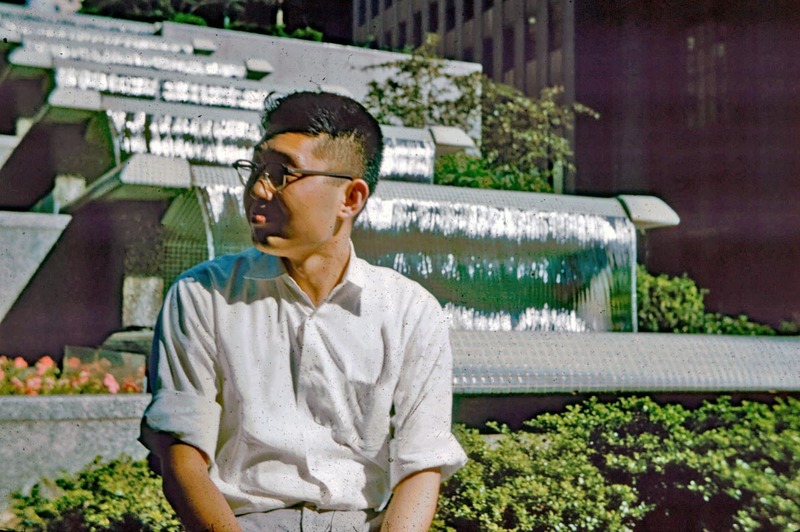 This photo was taken in front of Margaret Morrison-Carnegie Hall, and its entrance is behind the Margaret Morrison Arch (photo taken in 1957). This complex was called Margaret Morrison College, and was dedicated to women's higher education. 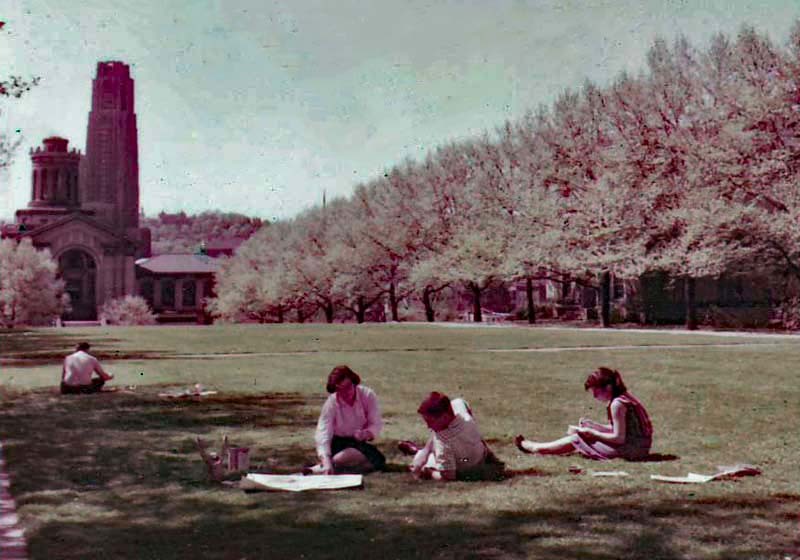 When I was a student (1954-58), I did not think much of this place because women were still women in college, and it was unthinkable to sit down with girls studying there. 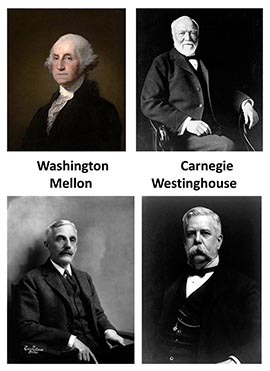 At that time, Ivy League universities did not admit women. The Carnegie family had enough foresight to attach women's programs to a male-dominated engineering college. 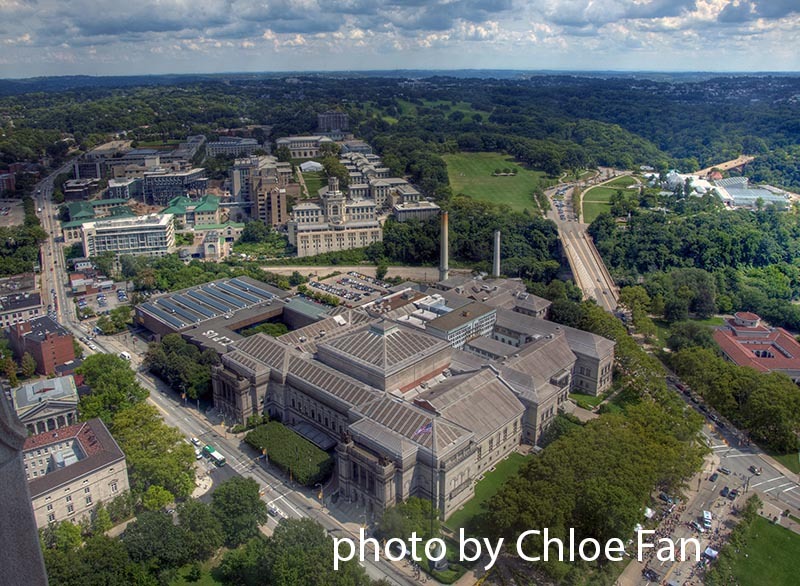 Thanks to those ladies, Carnegie Mellon enjoys first-class liberal arts programs, including literature, education, music, painting, drama, architecture, as well as business and economics. Vibrating Knees. While I was a student there, there was a crazy mixed-up boy. When he was drafted, we were confident that the U.S. Army would straighten him up. Alas, he changed the world. These days, I am so proud to tell everybody that I was born in the same year as Elvis the King came to this world. Korean Girl with exposed knees, and with covered knees. While at Carnegie, I used to get letters from this Korean girl also studying in the United States. She later became my wife. 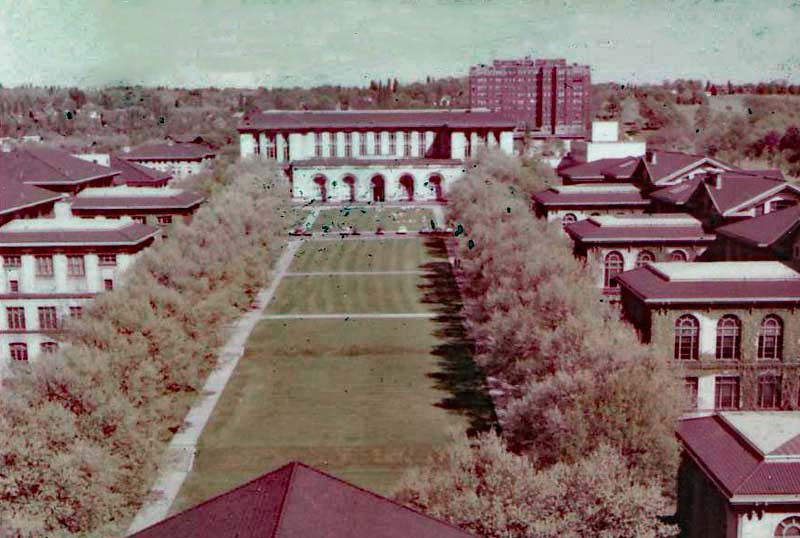 The Mall of Carnegie Tech in the spring of 1957. It was a beautiful spring day. 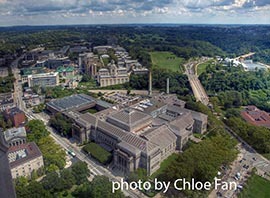 The Mall of Carnegie Mellon University in the summer of 2004. The tall building in the background is the tallest university building in the world. 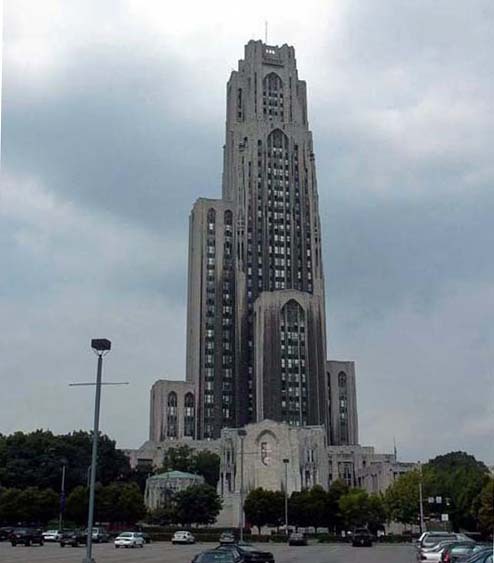 This building, called the Cathedral of Learning, belongs to the University of Pittsburgh. 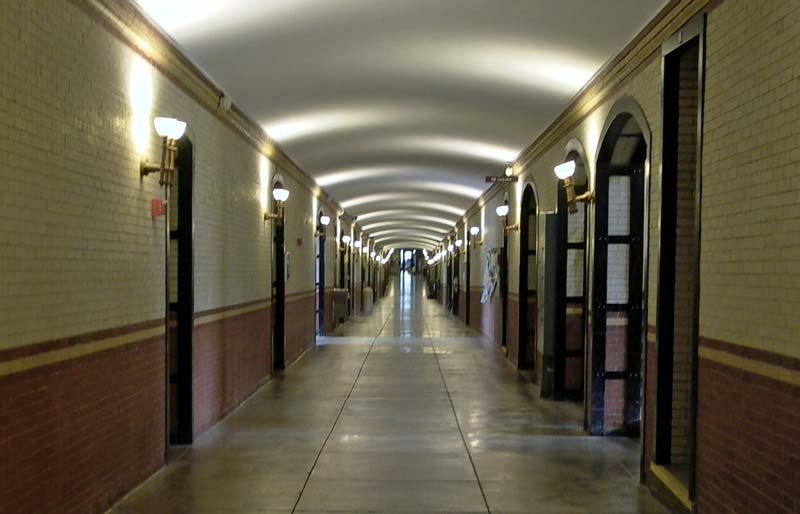 Infinite Corridor in Baker Hall housing administration and class rooms. This building has six wings, and thus infinite number of class rooms. 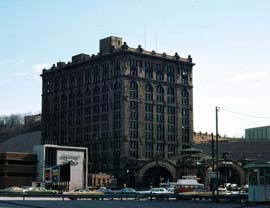 Machinery Hall (1957) is at the western end of the mall. Machinery Hall seen from the opposite side. 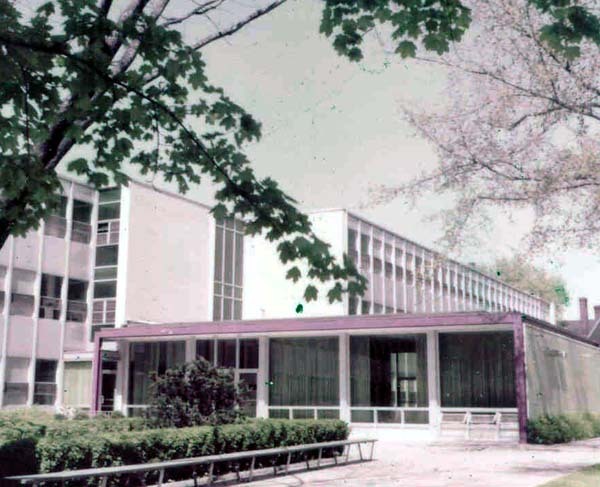 School of Architecture (1957) is at the eastern end of the mall. School of Architecture (2004) still enjoys its excellent reputation. Cyclotron. 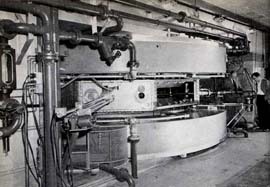 Carnegie Tech was operating a 450-MeV cyclotron. This was one of the four-biggest cyclotrons in the world when I went to Carnegie Tech in 1954. Because of the radiation danger, it was located at a village called Saxonberg, about 40 miles North of Pittsburgh. 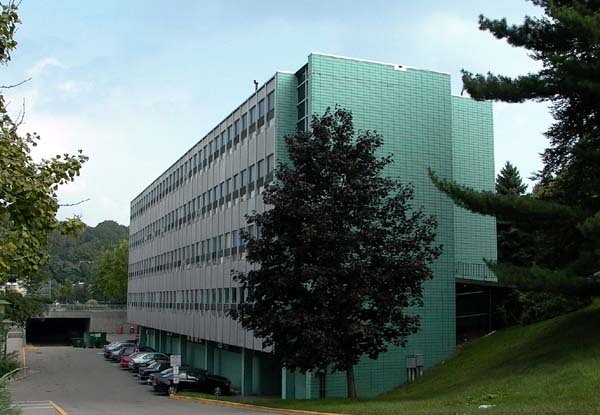 I worked at this cyclotron laboratory during the summer of 1957. Sputnik. On October 4, 1957, the Soviet Union launched the first artificial satellite around the earth. It was a history-making event, especially to Americans. Why didn't Americans do this first? This was how the NASA was created. Carnegie Library. Because of its name, and because it is located near CMU, many people think this is CMU's library, but it is not. 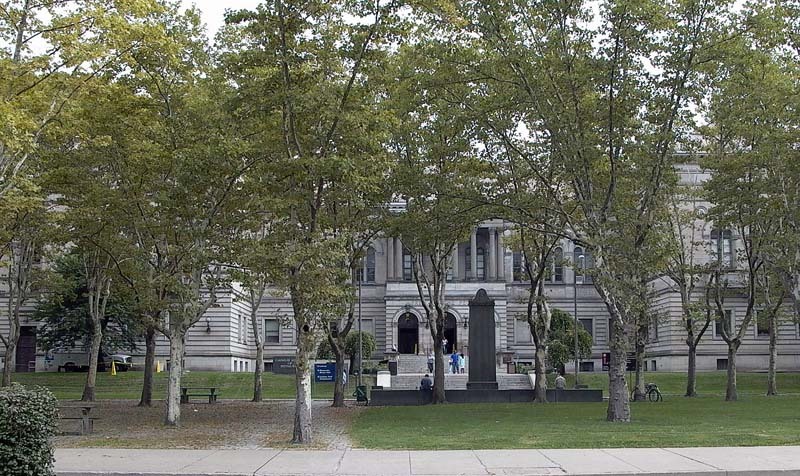 Andrew Carnegie built public libraries in all major cities throughout the United State. This Carnegie library is the first one he built. I used to go there very often because this library has many interesting books about the world. 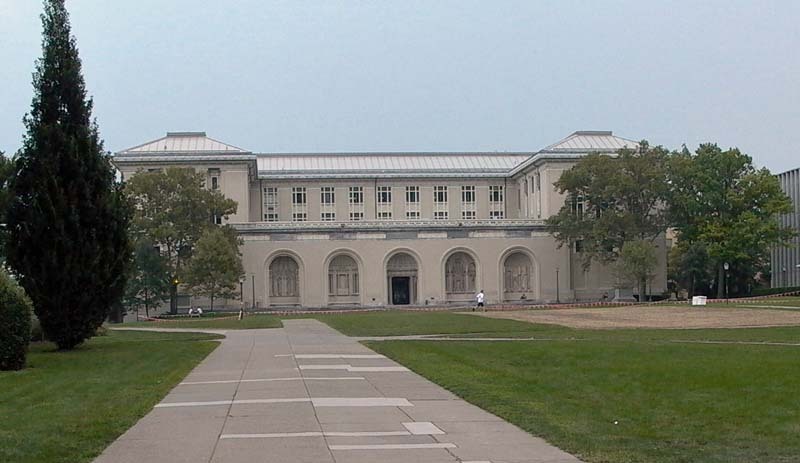 Closer view of the library building. Side door of the library building. I used this door to go to directly to the reading room. This library has a complete set of microfilms (they did not have digital technology then) of all Pittsburgh newspapers. In 2003, I was able to find a photo of myself which appeared in the Pittsburgh Post-Gazette. 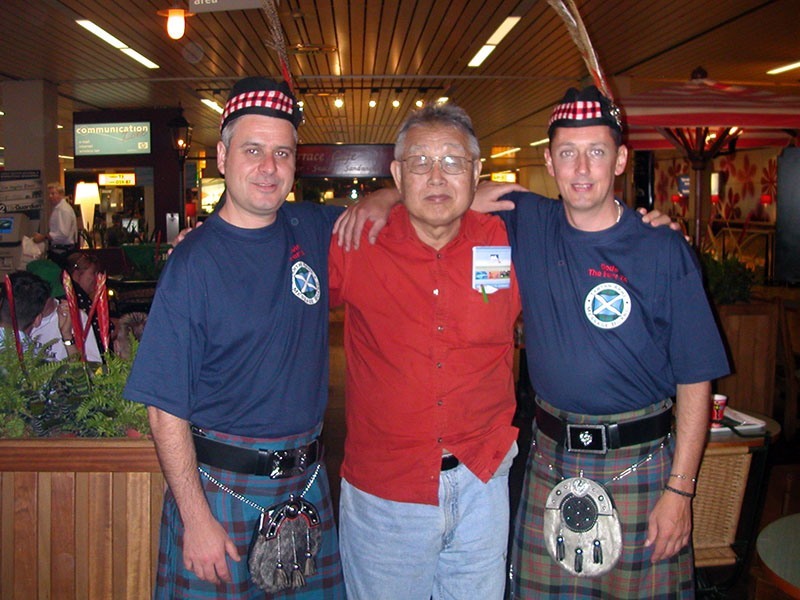 In this photo I am with my high-school principal in Korea and a Korean friend who came to Carnegie Tech one year earlier. 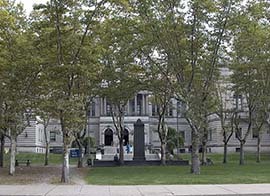 The University of Pittsburgh is just west of the Carnegie Library. 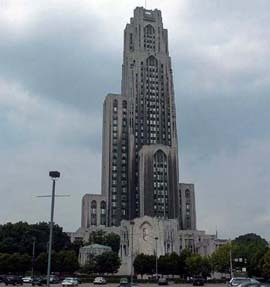 The campus has a tall structure called the Cathedral of Learning. This university is routinely called Pitt. Thus, the Pitt is the tallest university in the United States. 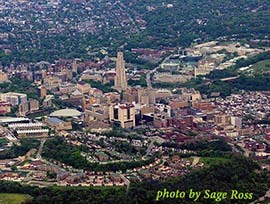 This aerial view shows the campus is built around the Cathedral of Learning. This photo also shows the CMU campus at the upper right corner. Cathedral of Learning is the main building the University of Pittsburgh, and is the tallest university building in the world. 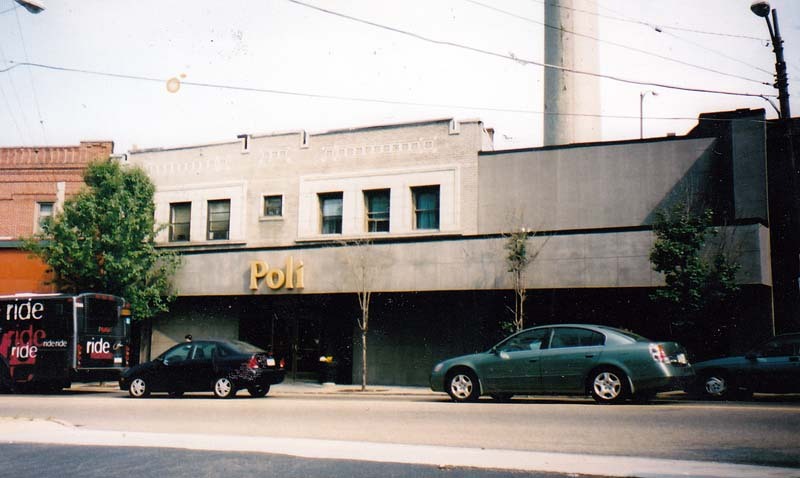 It of course serves as one of Pittsburgh's landmarks. From the Mount Washington. The Cathedral is so tall that it can be seen from the top of the Mount Washington five miles away. Here is another photo of the Cathedral taken in 1969. 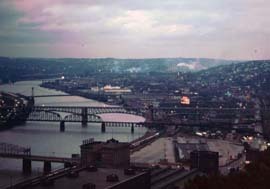 Pittsburgh was still a smoky city. Seen from the CMU campus. 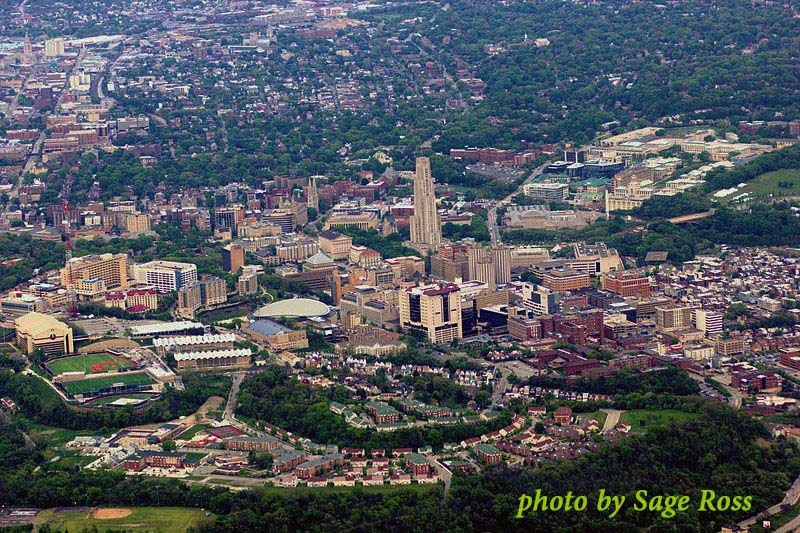 The University of Pittsburgh is within a walking distance from CMU. 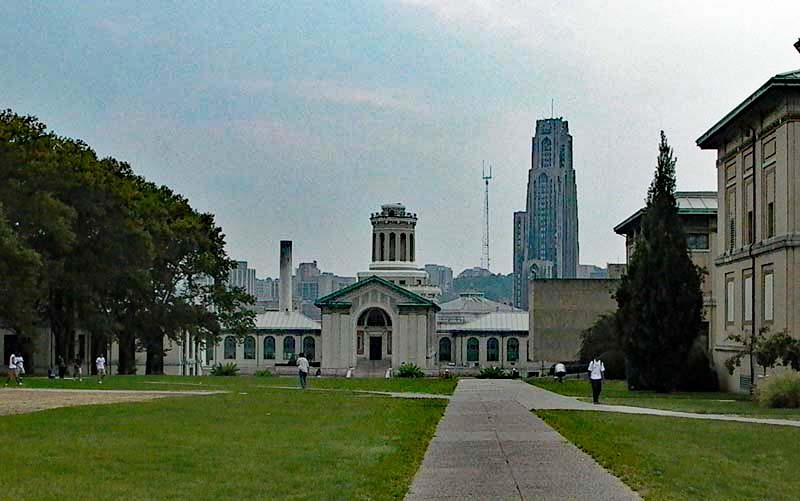 The Cathedral of Learning is seen from the CMU campus. Syria Mosque was also within a walking distance from CMU. Presumably this building was built by Syrians, and it has Syrian marks. 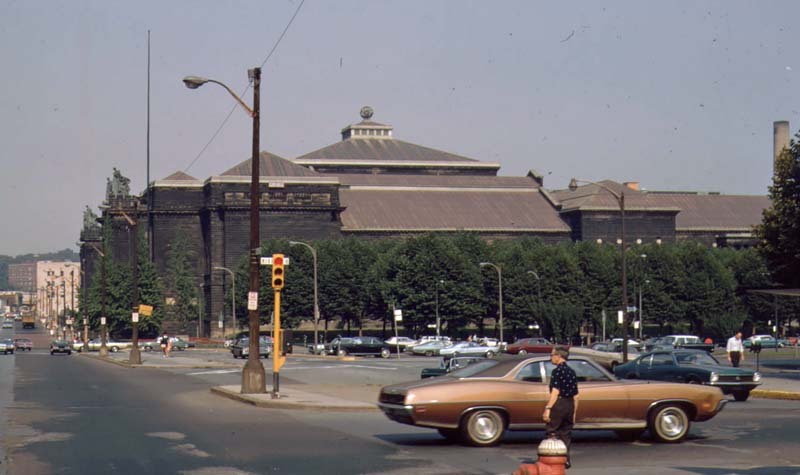 But its primary function used to be the home of Pittsburgh Symphony Orchestra. Pittsburgh Symphony may sound somewhat provincial to you, but many of the greatest conductors came from this music organization. The early music directors include Victor Herbert, Otto Klemperer, Fritz Reiner, William Steinberg, Andr� Previn, and Lorin Maazel. Click here for more about this great music hall. I built up the basic background in music listening during my high school years. Koreans are music-lovers. In addition, I had a short-wave radio to pick up music programs from Japan. I had admirations for those great names in music including Eugene Ormandy, Edward van Beinum, Arthur Rubinstein, Isaac Stern, and Jascha Heifetz. While in Pittsburgh, I was able to see those real persons. Click here for music places I visited in later years. 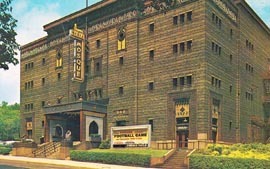 Heinz Hall for performing Arts is now the home for the Pittsburgh Symphony Orchestra. 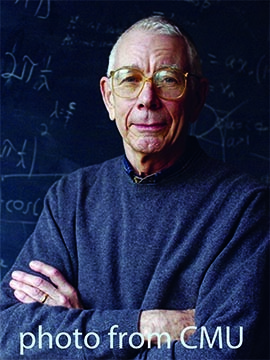 Hugh D. Young was a graduate student when I came to Carnegie Tech in 1954. We shared often breakfast table in the student dining hall called Skibo throughout my years until 1958. He was interested in many things, particularly in music. However, the most important aspect was that he was an excellent teacher even when he was a graduate student. I learned the real physics from him. He also wrote a recommendation for me when I was applying for graduate study at Princeton. Here are some of the textbooks written by him. Lincoln Wolfenstein is of course a distinguished physicist and cannot be separated from American physics. He taught me modern physics during my junior year. 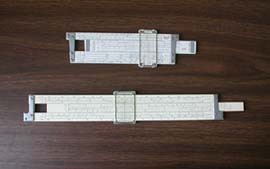 Students in his class used to complain that they had to spend most of the exam time on the slide rule (calculator). Thanks to him, I firmly believe physical theories should produce observable effects, useless otherwise. 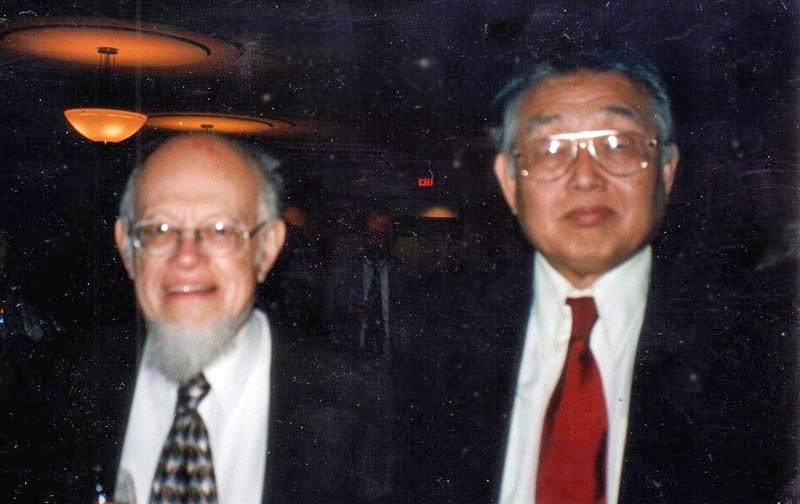 This photo was taken in 1997 at MIT. Michel Baranger taught me quantum mechanics, and how to solve Schroedinger equations for bound states, in terms of localized wave functions. Thanks to him, I was able to clear the confusion caused by the np mass difference calculation by Dashen and Frautchi. Click here for the detailed story. 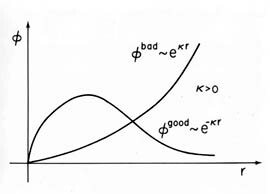 This graph with good and bad bound-state wave functions serves as one of my professional logos. When my colleagues think about me, they think about this figure. 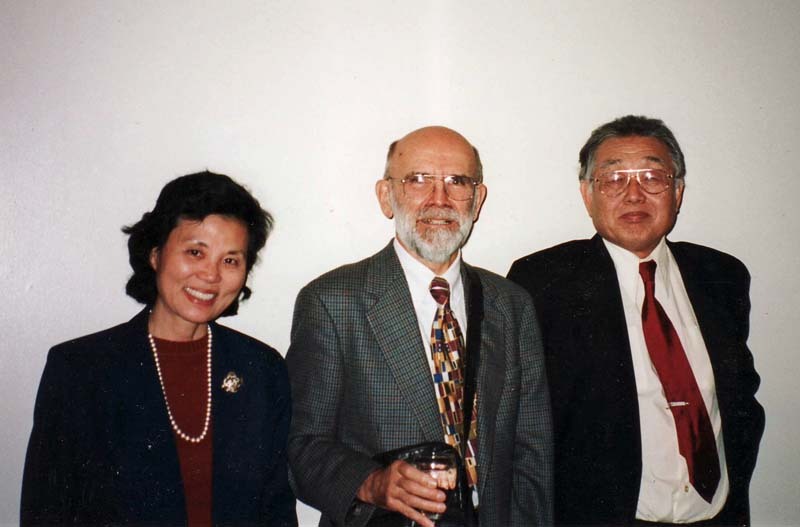 Robert Siegel was another Carnegie professor I should not omit. He was my advisor during my junior and senior years. 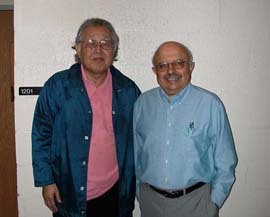 He was key person at the Carnegie's nuclear research center. I worked there during the summer of 1957. Laboratory Report. While I was student there, I really enjoyed laboratory courses. I used to write my lab reports with this cover. Experimental Data Log. 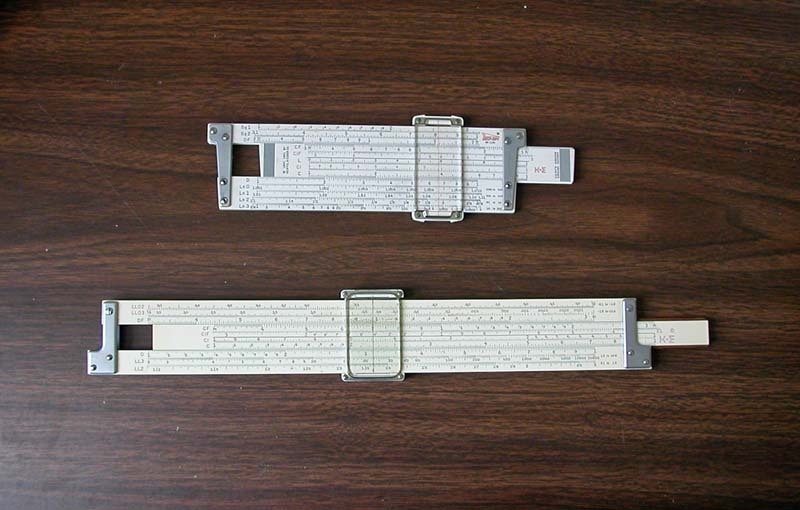 I used to write down measured numbers on this sheet. My Student ID card of 1955-56 for the fall semester of my sophomore year. Gaurang Yodh also came to the University of Maryland from Carnegie, one year before I did. He studied at the University of Chicago with Sam Treiman, who was my thesis advisor at Princeton. I used to consult with him whenever I had difficult problems. 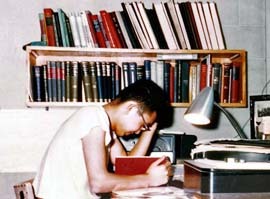 Satindar Bhagat came to the University of Maryland in 1962, like me. He came from Carnegie Tech. We have been in the same department. He has been an excellent teacher and popular among student. Sometimes, I was a good teacher. 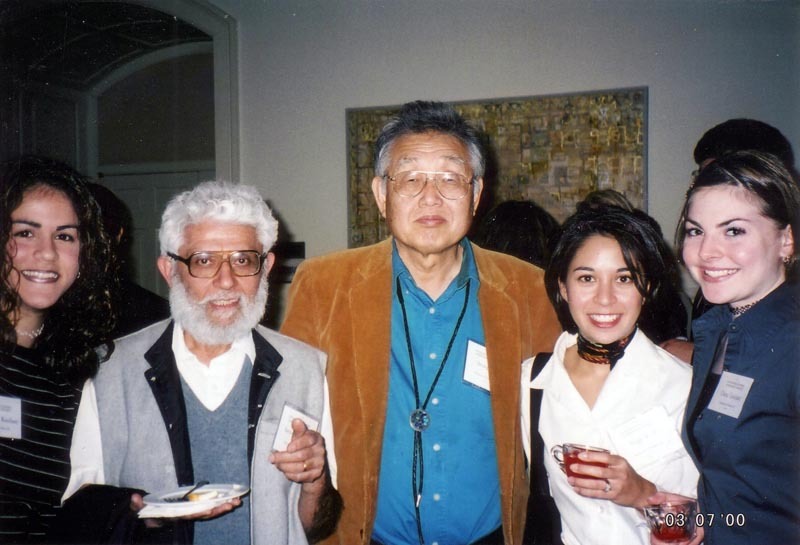 In 2003, we were both elected as exemplary physics teachers, and were invited to a student party. Here we have a photo with students. Colin Morningstar is a physics professor at Carnegie-Mellon University. Presumably he was born after I left Pittsburgh in 1958. 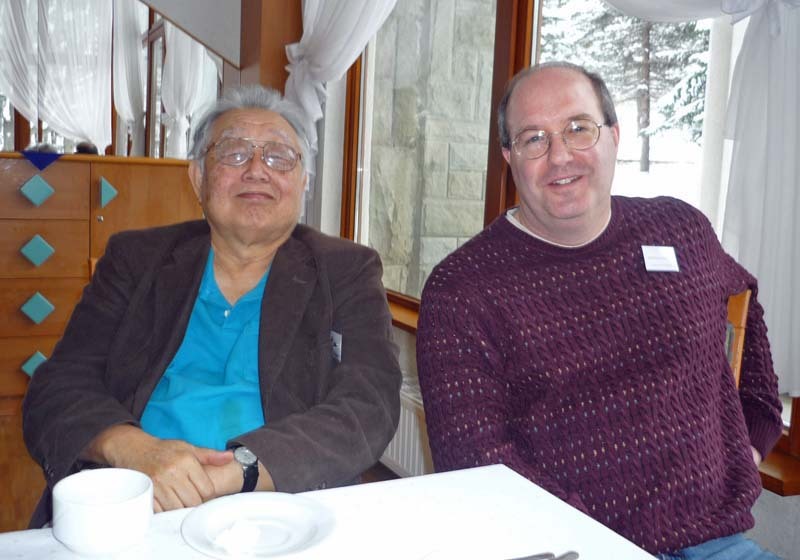 I met him in Zakopane (Poland 2009) while attending a QCD conference. We talked about Pittsburgh, both old and new. Samsung was an obscure candy company when I left Korea in 1954. These days, you see Samsung signs everywhere in the world. One of my high-school classmates told me he thought about me when he decided to send his son to CMU in 1979. 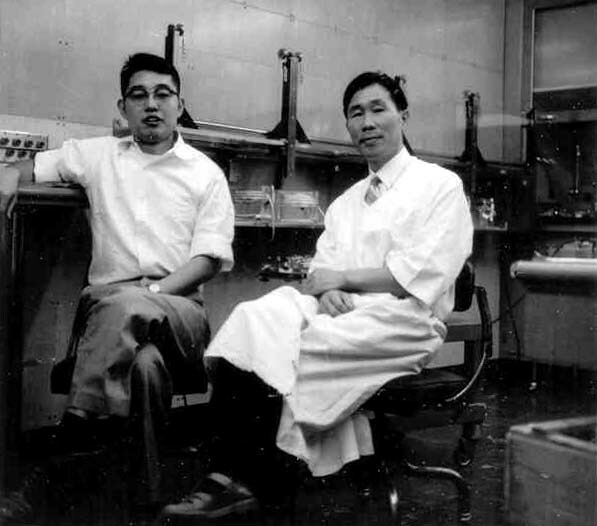 His son is now a big shot at the Samsung Electronics Laboratory in Korea. Another Korean friend of mine told me the Samsung Lab is run by the CMU mafia. Perhaps an exaggeration to make me happy. 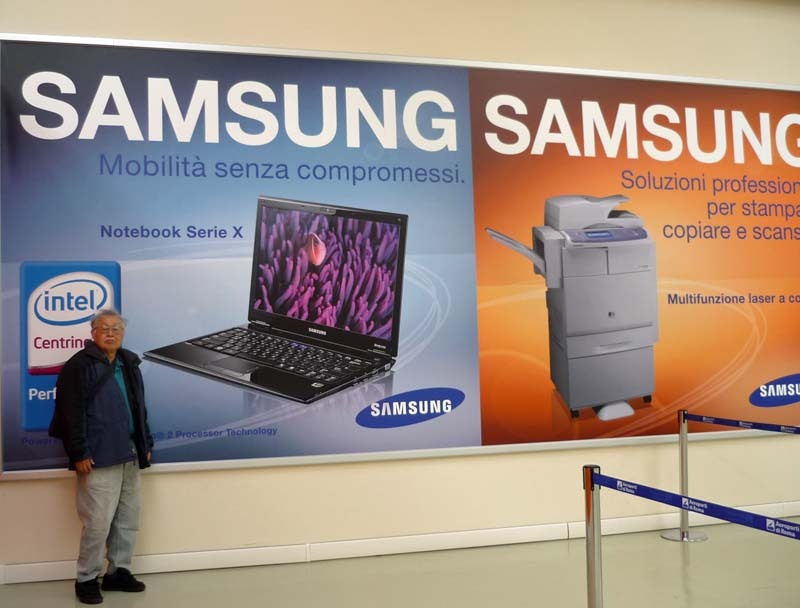 In either case, whenever I see the Samsung sign, I think of Carnegie as well as my Korean background. 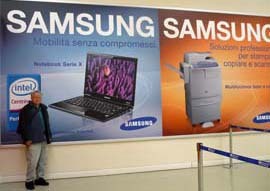 This photo was taken at the Leonardo da Vinci Airport near Rome (February 2009). Three Rivers. 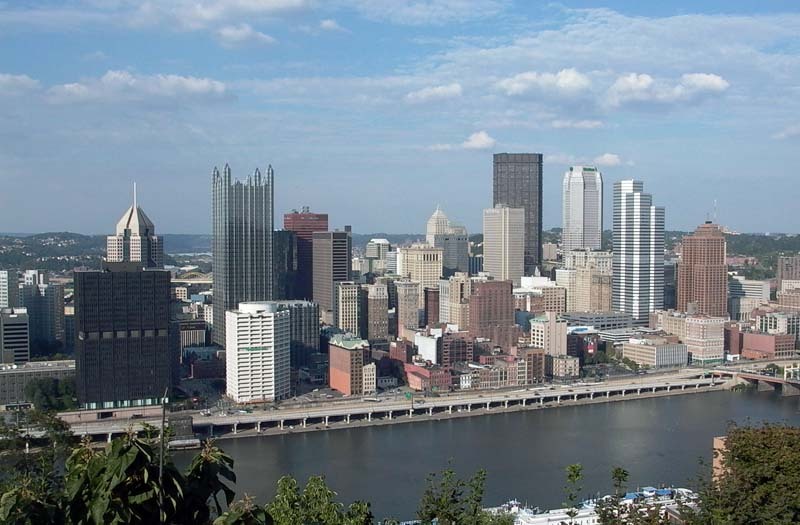 The city of Pittsburgh was developed on the area between two rivers, namely the Allegheny River (north) and the Monongahela River (south). These two rivers merge at the downtown area to become the Ohio River which eventually goes to the Mississippi River. This photo was taken from the Ohio River. There are two bridges across the two Rivers. 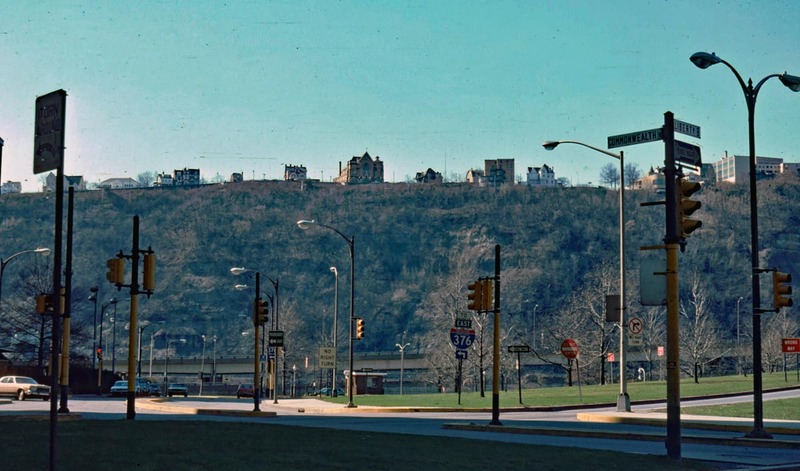 Fort Pitt. The Ohio River used to be a vital transportation route to the agricultural land of the Midwest. 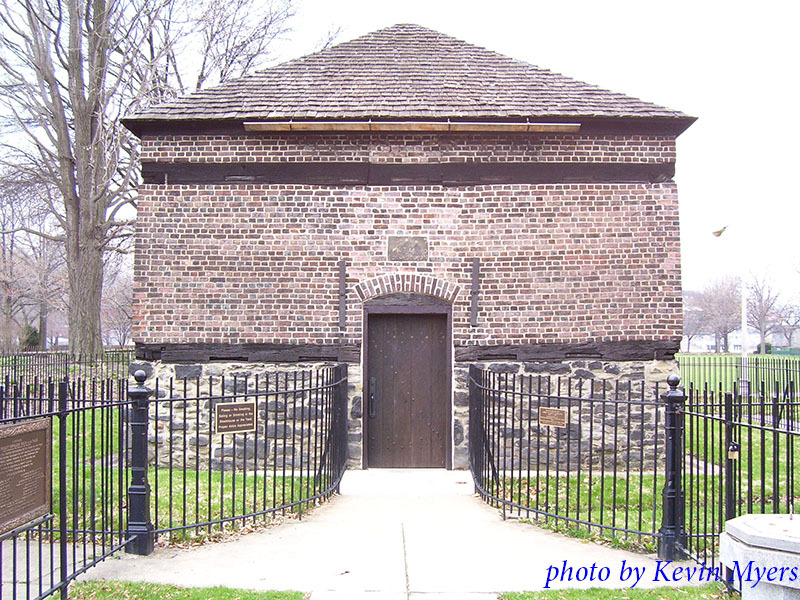 This area became was a major transportation center for early European settlers, and had to be guarded by military forces. 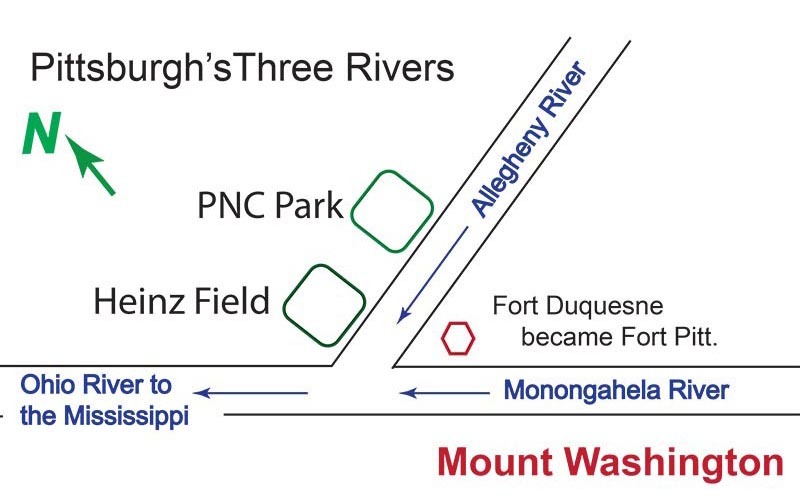 There was a French military post called Fort Duquesne, taking orders from the French headquarters in Quebec. About ten years before the American Independence, it was taken over by the British colonial army after three battles. 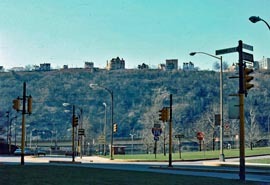 The place was renamed as Fort Pitt. The key military officer in the British army was George Washington. 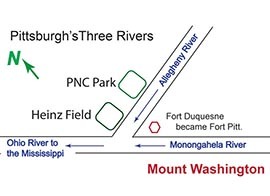 Indeed, George Washington gained his military background for his historic mission from his Pittsburgh battles. In reality, his battles consisted mostly of gaining political supports from local (American) Indians. A brilliant idea indeed!! Fort Pitt Park. 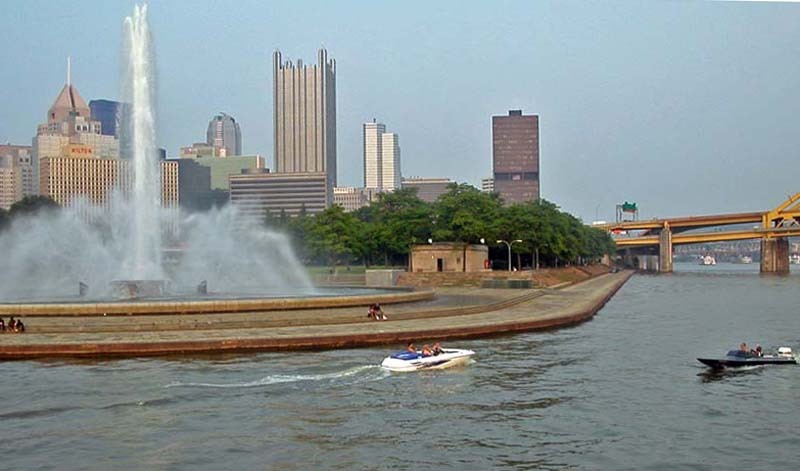 The area surrounding this Fort is called the Fort Pitt Park. This photo was taken in 1969 from the top of the hill across the Monangahela River. This hill is called the Mount Washington for a very good reason. 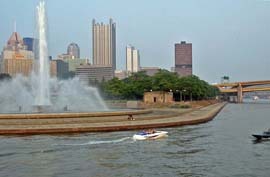 The Fort Pitt Bridge is in front of this park, and the Three River Sports complex is across the Allegheny River. 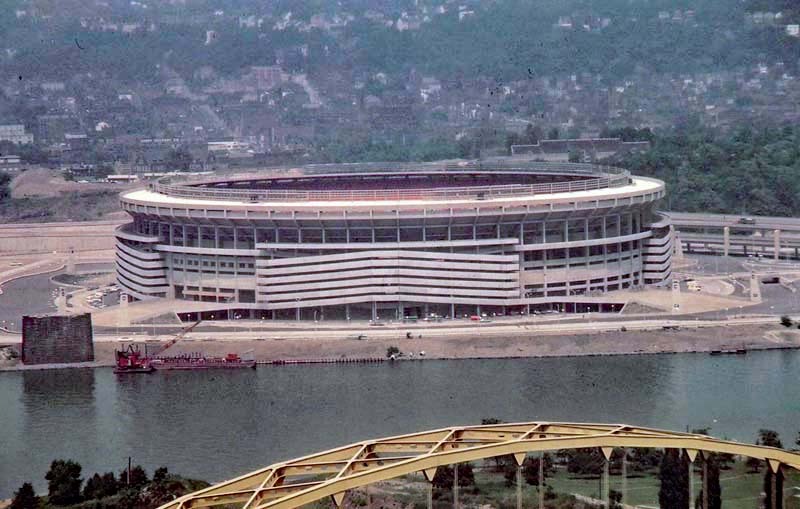 This sports complex is now replaced by the Heinz Field which servers as the home base for the football team called "Pittsburgh Steelers." 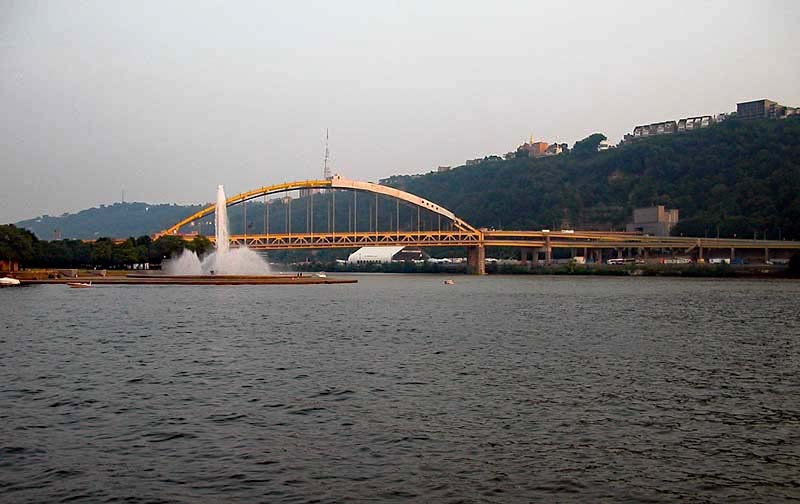 The bridge across the Allegheny River is called the Fort Duequesne Bridge. Livable City. 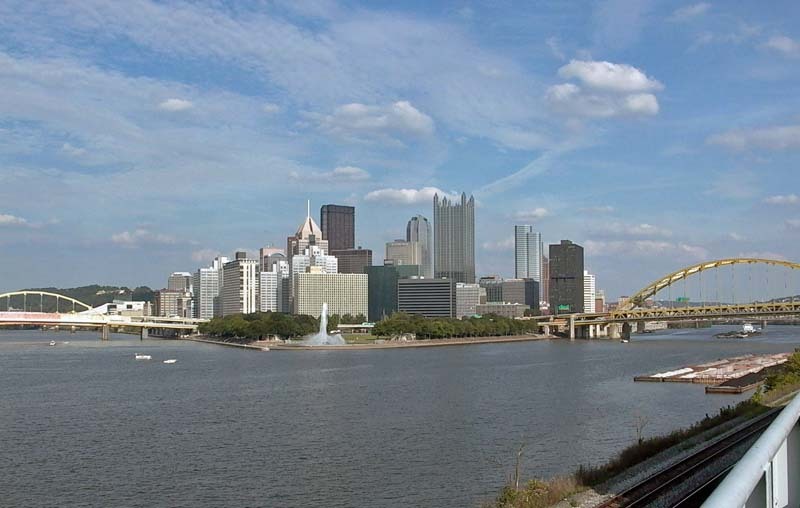 Those three rivers used to be very dirty when Pittsburgh was a steel city. 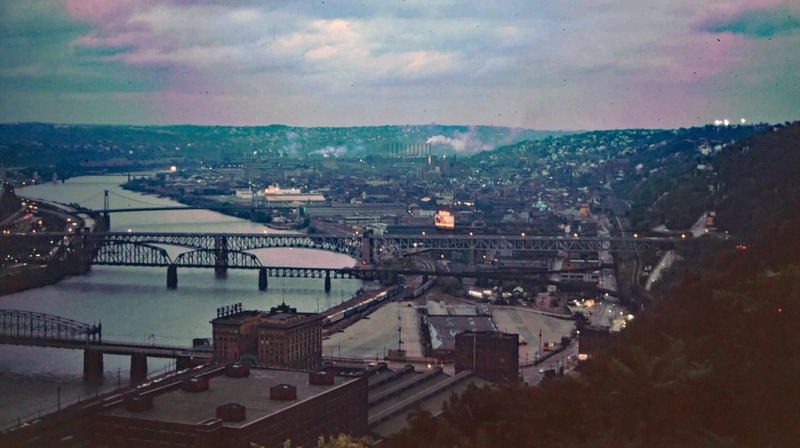 There are no steel mills now, and Pittsburgh is known as one of the most livable cities in the world. 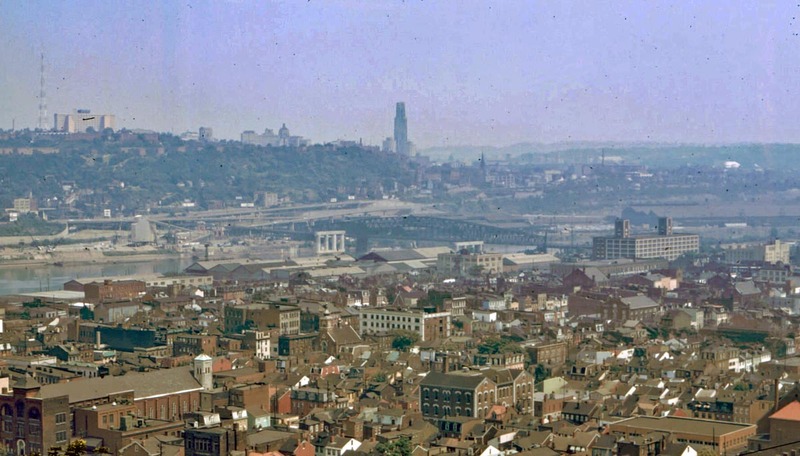 Pittsburgh was a smoky city during my time (1954-58). 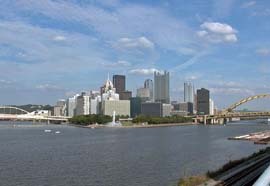 See this webpage if you are interested in visiting Pittsburgh. Mount Washington, south side of the Monangahela River. 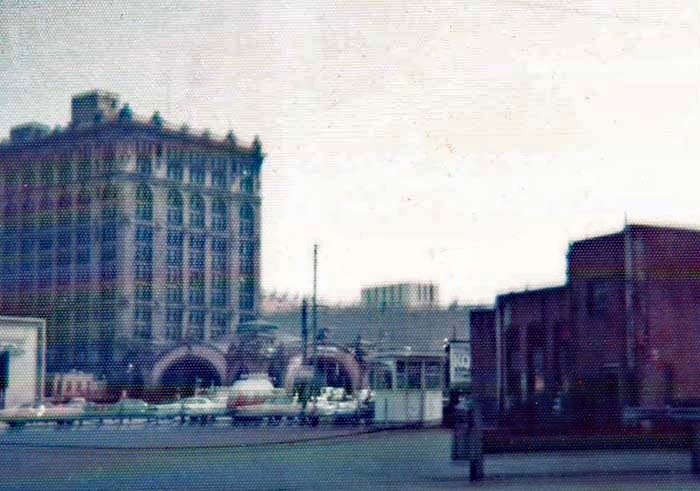 This old photo was taken from the downtown now called Gateway. Mount Washington seen from the Ohio River. 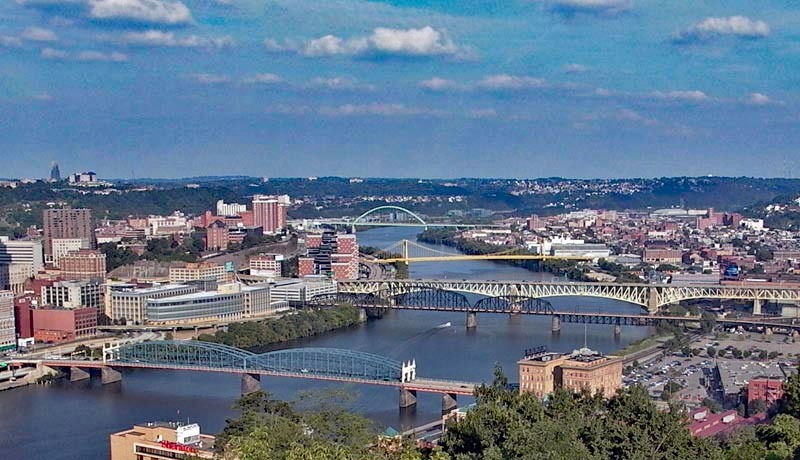 The top of this high land is the ideal place to take photos of Pittsburgh. 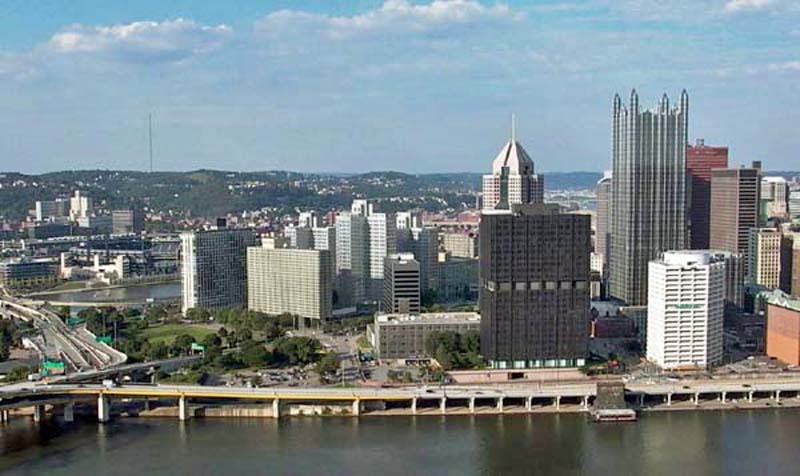 Downtown from the Mount Washington (2004). 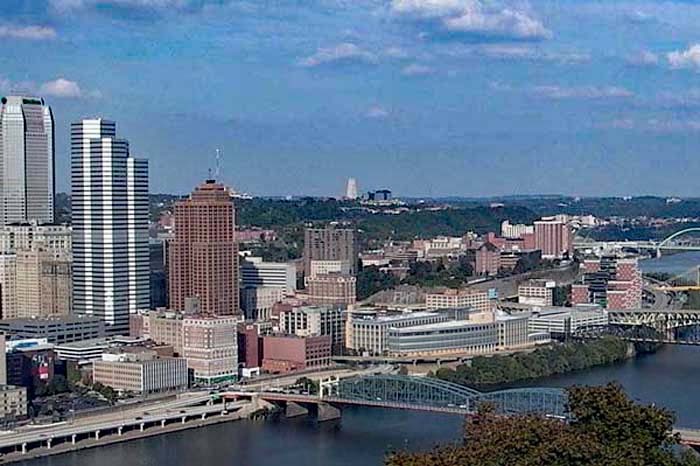 This photo of downtown was taken at the top of the Mount Washington on the south side of the Monongahela River. Another photo of (old photo). Bridges. Pittsburgh is a city of bridges. All the bridges were built from steels produced by nearby steel mills. Highland Reservoir. 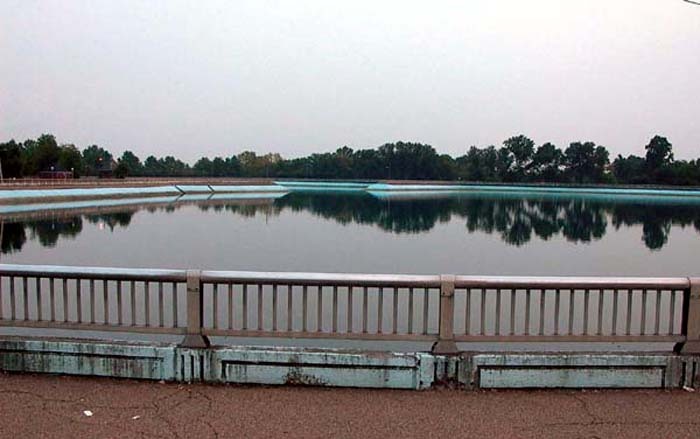 This is a reservoir at the High Land Park near the Allegheny River. This reservoir once supplied water to the city of Pittsburgh when I was there (1954-58), but is now used for recreational purposes. It cleans up your heart and mind. 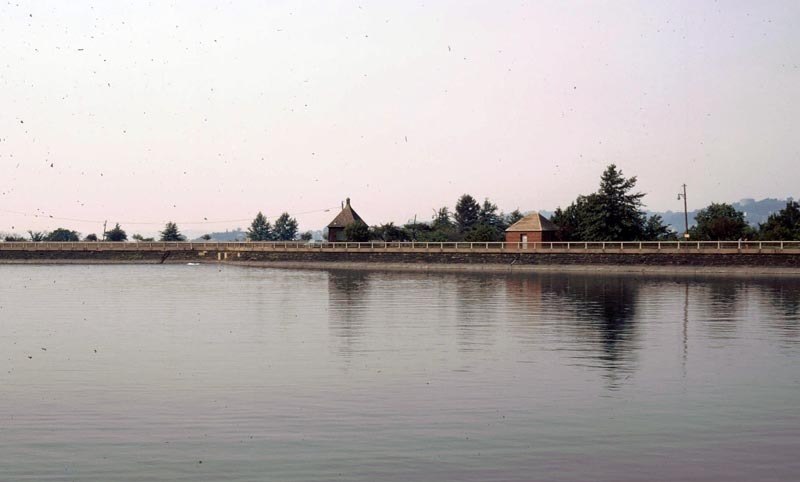 In 1971, I was at this reservoir with my family. In 2004, I was there again to clean up my heart and mind. 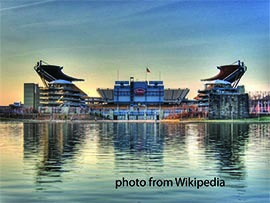 The Heinz Field is the home of the football team called "Pittsburgh Steelers. 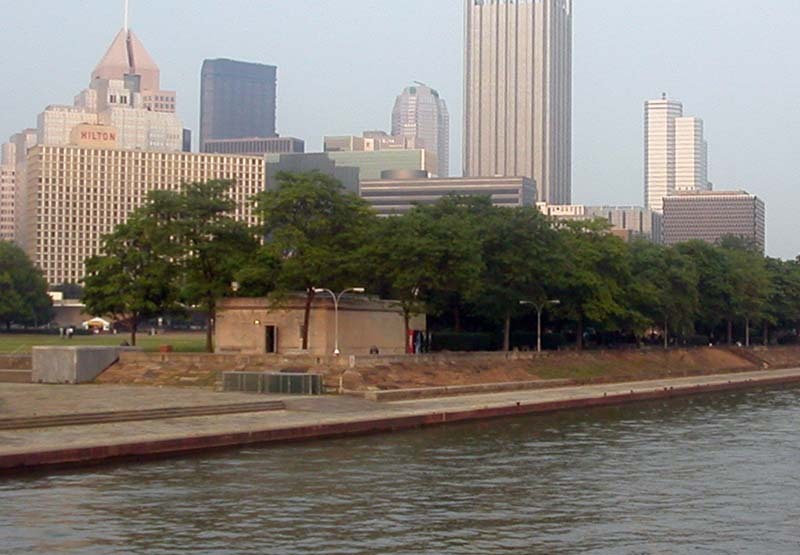 It is one the northern bank of the Ohio River, just north of the Fort Pitt Park. Closer view of the Field. 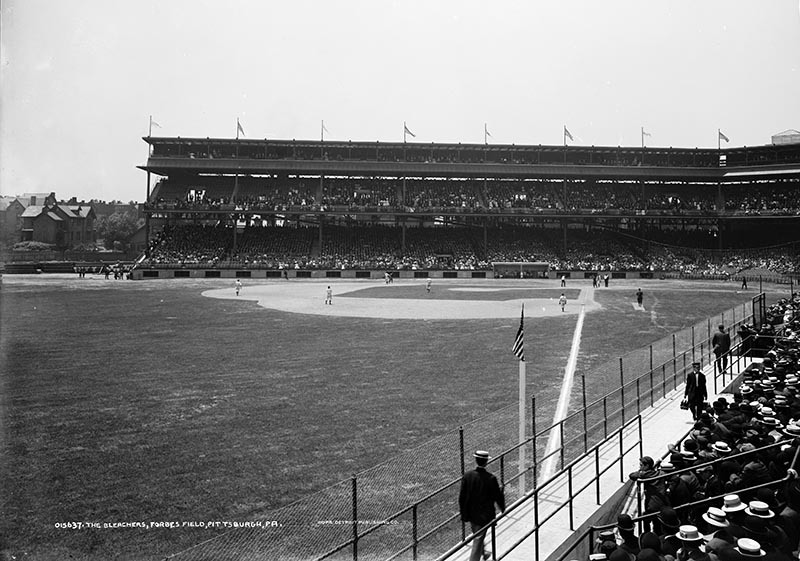 Old sports stadium. 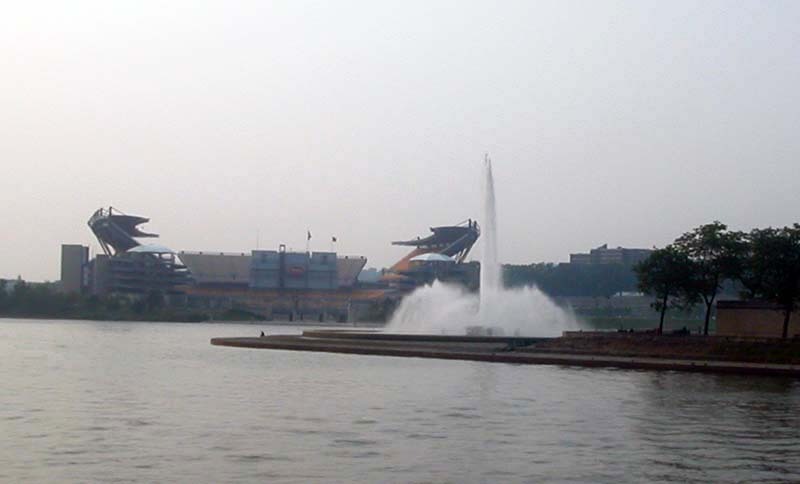 This structure was built after I left Pittsburgh in 1958, and was replaced by the Heinz Field when I was there in 2003. PNC Park is the home base for the Pittsburgh Pirates. 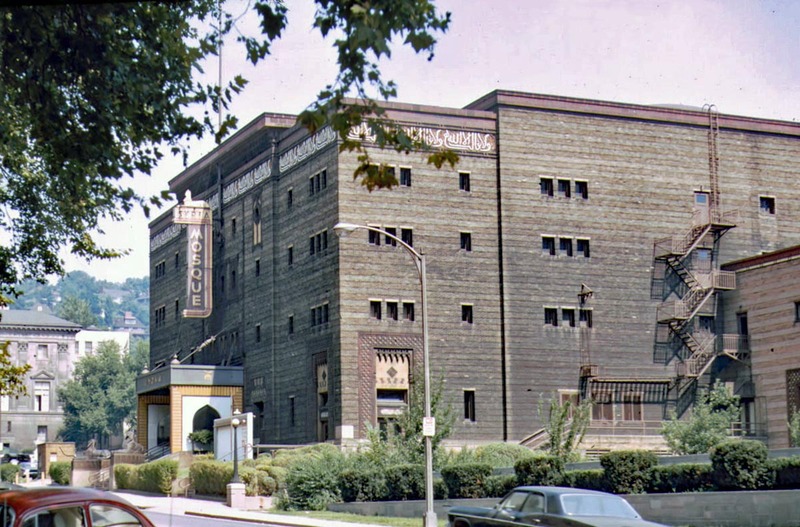 When I was in Pittsburgh (1954-68), the home base was the Forbes Field near the Univ. of Pittsburgh. Click here for the Wikipedia story about the PNC park. 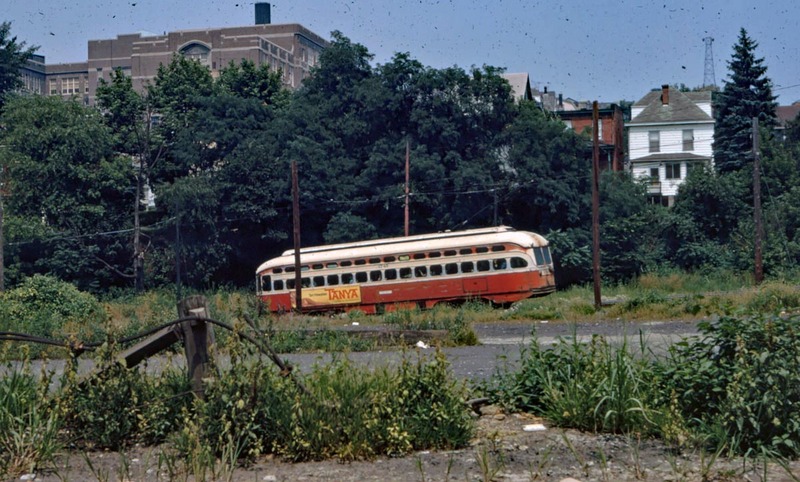 The Forbes Field, near the campus of the Univ. 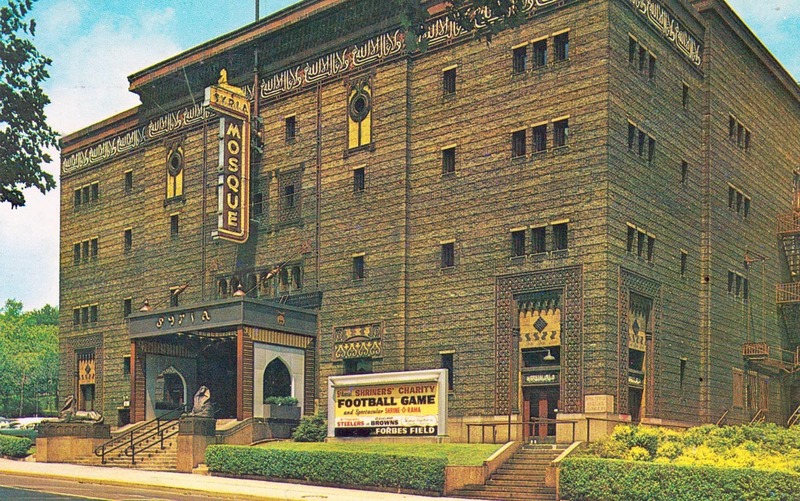 of Pittsburgh, used to serve as the home for both the football and baseball teams of Pittsburgh, when I was there from 1954 to 1958. Aluminium. 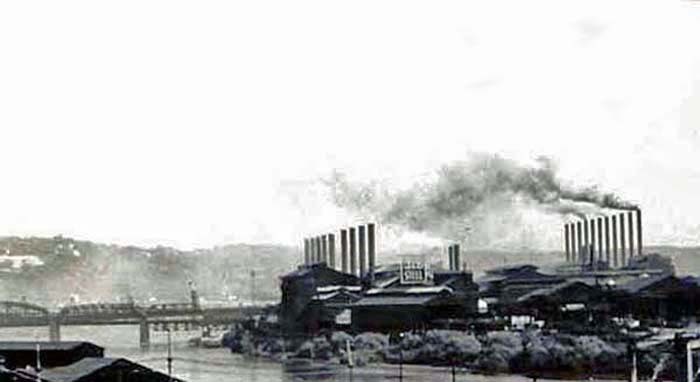 Pittsburgh was the home of the ALCOA (Aluminium Company of America) and is still the aluminium capital of the world. There are many aluminium buildings. 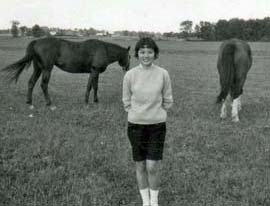 This photo was taken in the summer of 1957. 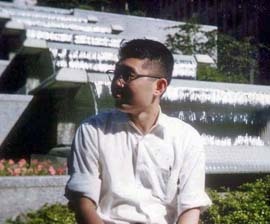 (2004) in front of the Donner Hall. 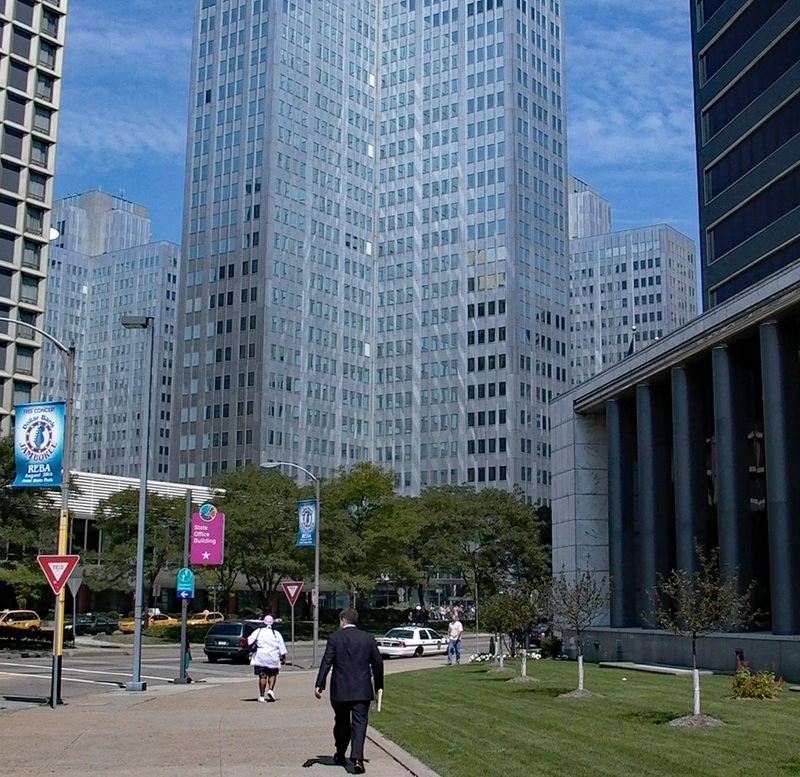 In 2004, these buildings are still there, and there are more (2004). Donner House (2004). There was and still is an aluminium dormitory building at Carnegie, now called Donner House. It was called Donner Hall when I was a student at the Tech. I stayed in this building during my senior year. 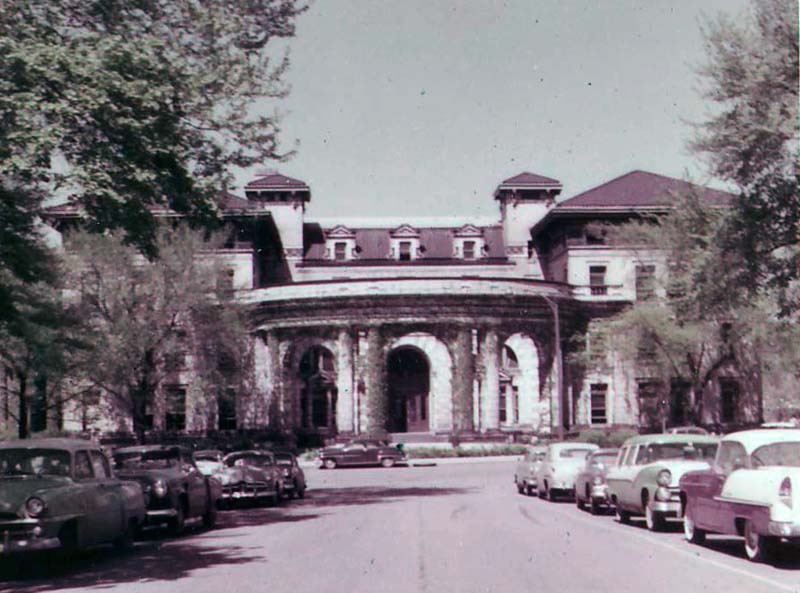 Entrance to Donner Hall (1958). 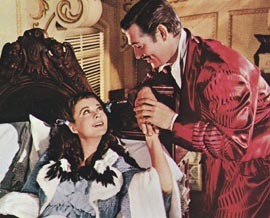 Room 307 (1958). I was in Room 307 with a roommate named Tom English. 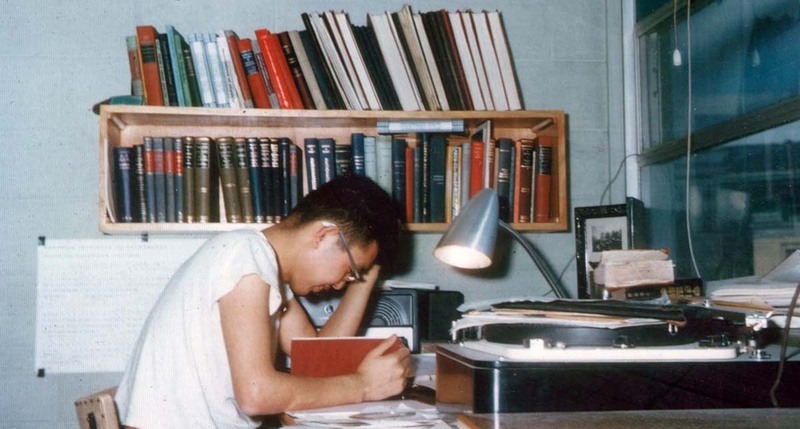 In this photo, I am listening to music while studying (1958). What is the black box next to me? Room 307 (2004). 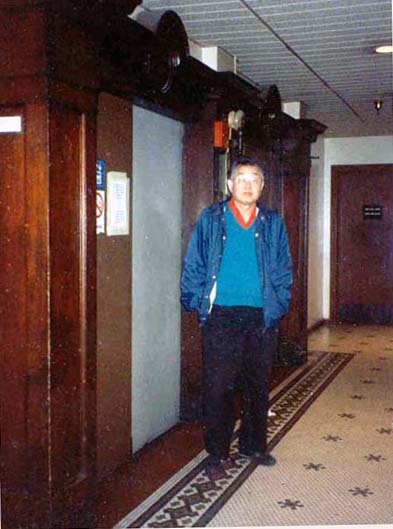 I visited this room in September of 2004, and had a photo with the two occupants of this room. 50 Years Younger. 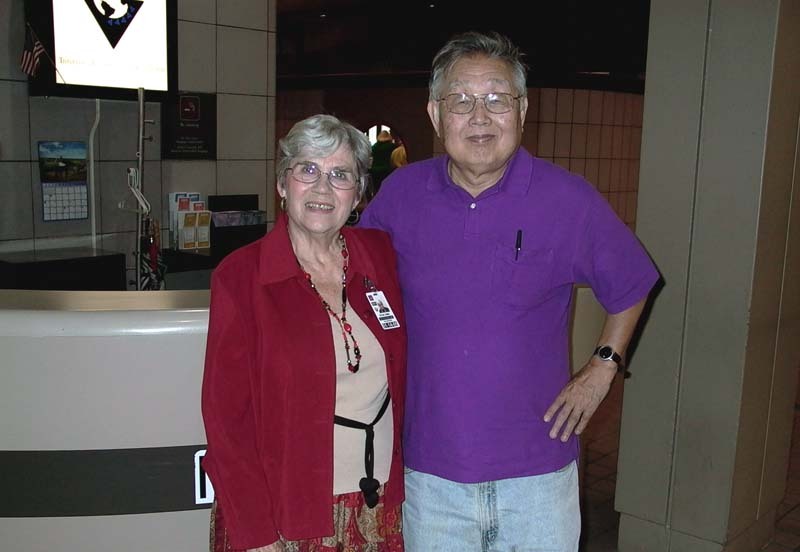 I was talking with an entering student in the fall of 2004, fifty years after I was an entering freshman there. She came from California to study architecture at CMU. She had an excellent future ahead of her. Chinese Restaurant. 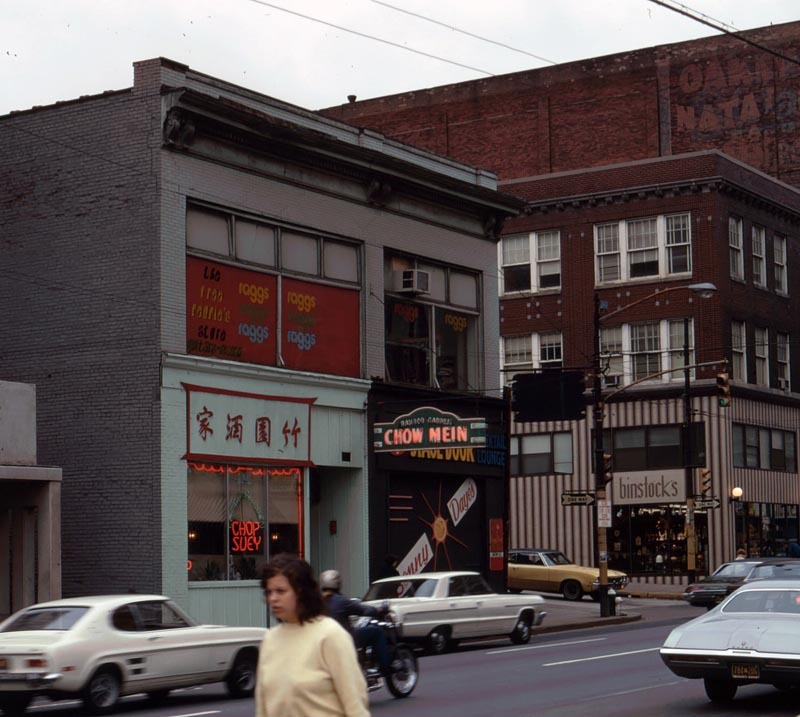 This was the first Chinese restaurant I went to in 1954, located on the 3rd Ave. downtown. It was still there when I visited the place 50 years later. The restaurant is now owned by the grandson of the original owner. Bamboo Garden was a small Chinese restaurant in the shopping district near the campus. I used to go there fairly often. Canton Tea Garden was about three miles from the campus, and I used to go there occasionally with my Korean friends. 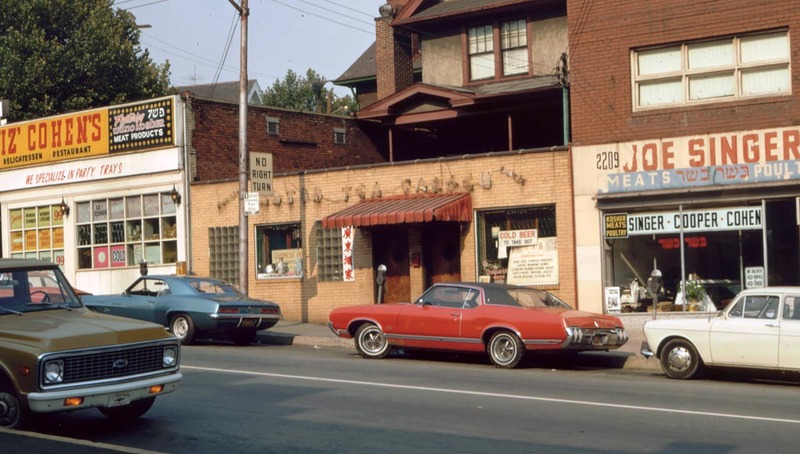 This restaurant was located in the Squirrel Hill district. This area was known as a Jewish town. You can see that this place was between the two shops carrying Jewish names. Italian Restaurant. 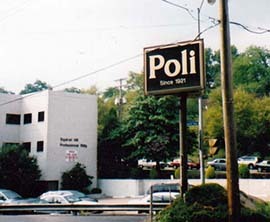 There was and still is an Italian restaurant called "Poli" in the Squirrel Hill area which is about two miles away from the campus of Carnegie Tech or Carnegie Mellon University. I used to walk there. I went there with my wife and a Korean lady who now lives in Pittsburgh. She is a research staff member at the Univ. of Pittsburgh Medical Center. Her father had two overlapping years with me in the high school I attended in Korea. She checks this Pittsburgh page carefully and sends me corrections and modifications as needed. Palomino. In order to conclude the trip to Pittsburgh to celebrate my 50th anniversary of my arrival in Pittsburgh and the United States, I went to a stylish downtown restaurant with my wife for a late dinner. 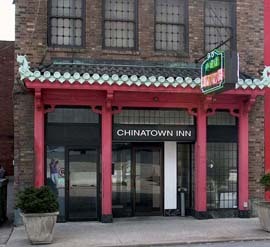 The restaurant is called "Palomino" and is located in the downtown business area called Gateway. Princeton. 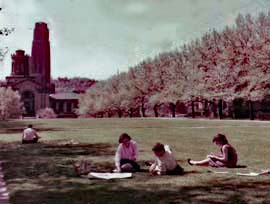 In the fall of 1957, I sent my applications to three graduate schools in physics, including Princeton University. 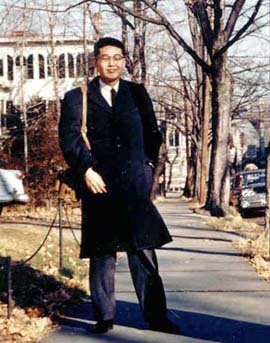 On March 12, 1958, I received a letter from the physics department chairman of Princeton telling me that I rank very high among the fifteen applicants selected for the PhD program. 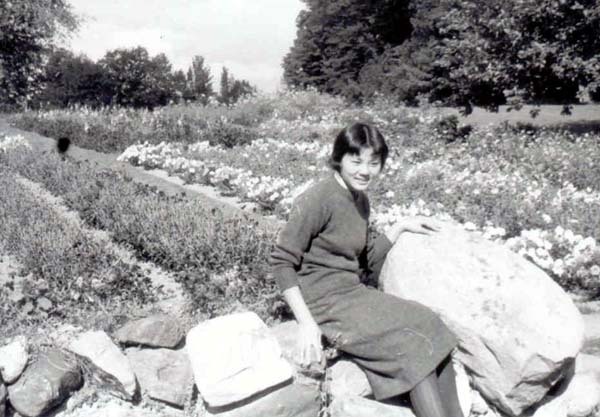 I then become a first-year graduate student there in the fall of 1958. In 1958. I looked like this when I went there in June. Cousin. 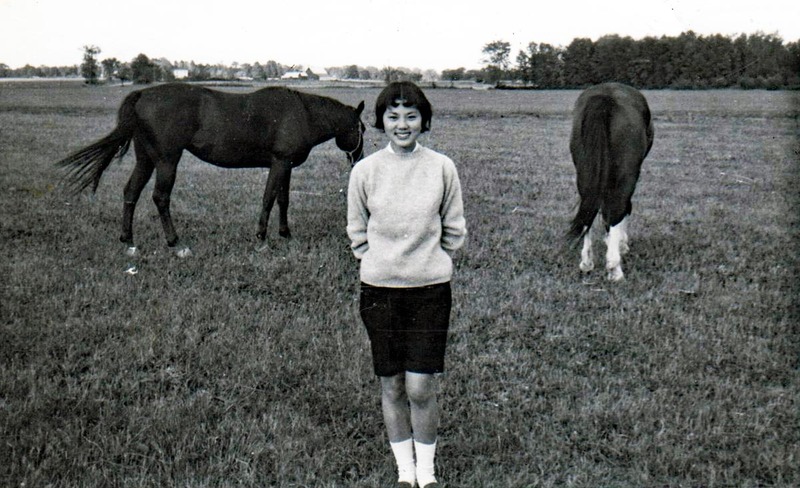 Also in June of 1958, I had a pleasure of making rail-road trips to visit my friends in other parts of the United States. 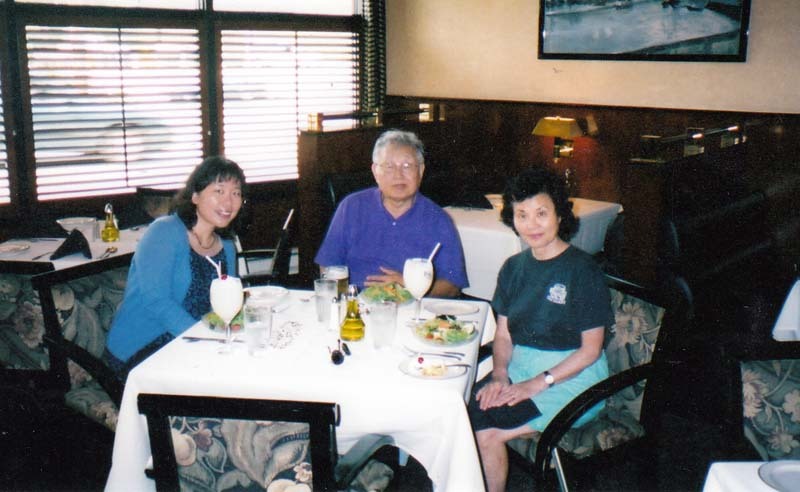 I went to all the way to Rochester, Minnesota to visit my cousin who was visiting Mayo Clinic at that time. This photo was taken in his laboratory. 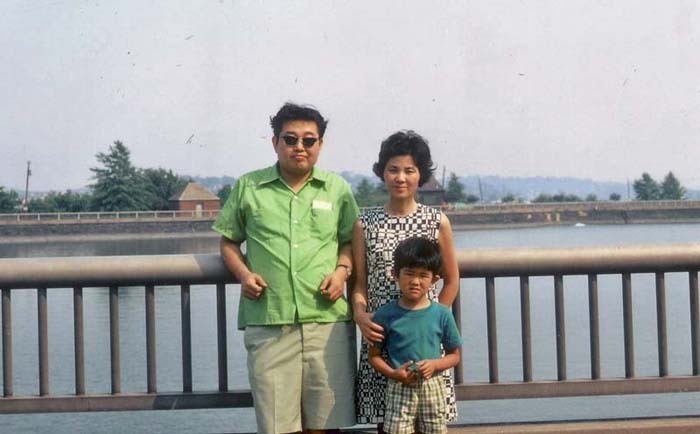 At that time, it was a rare privilege for Koreans to meet their relatives in the United States. 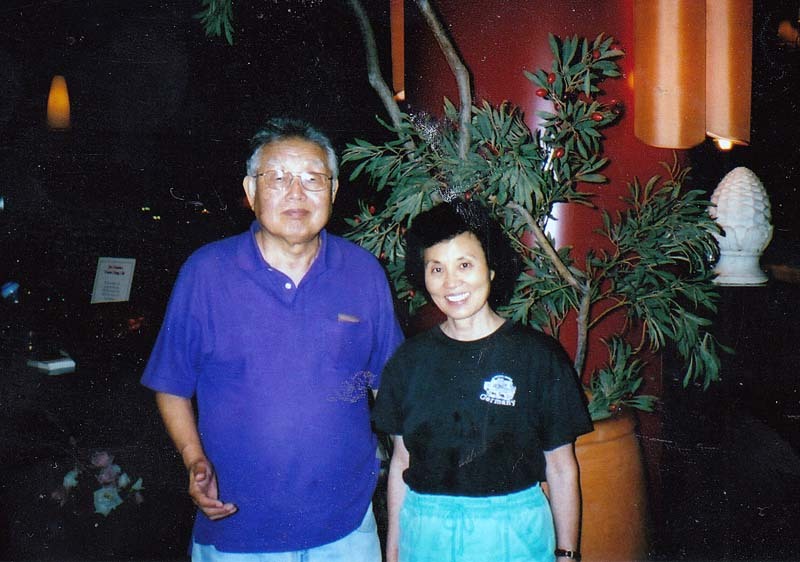 Earlier, he visited me in Pittsburgh, and we had a dinner together at my first Chinese restaurant in the United States. By 1960, I became like this. I look somewhat established in this photo. Campus. Princeton has a beautiful campus. P-rades. Princeton University has its unique tradition. Interesting and Famous. I met there many interesting and famous people. Andrew Carnegie came to Pittsburgh from Scotland. Who else came from Scotland? Emblem. 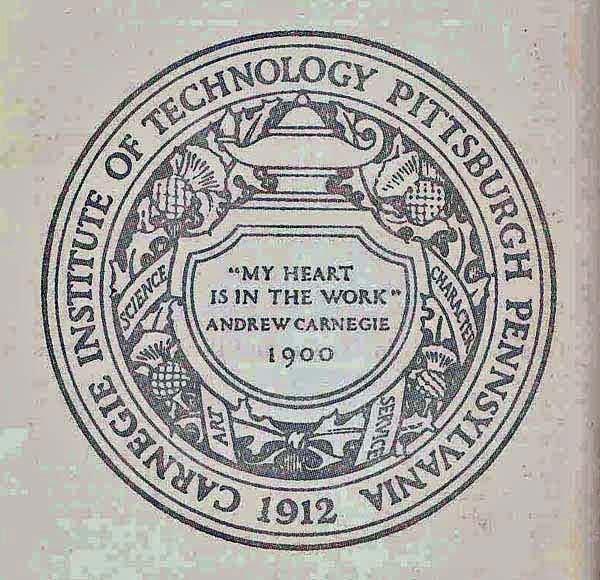 I believe in what he said in the emblem of the Carnegie Institute of Technology. Carnegie Band. 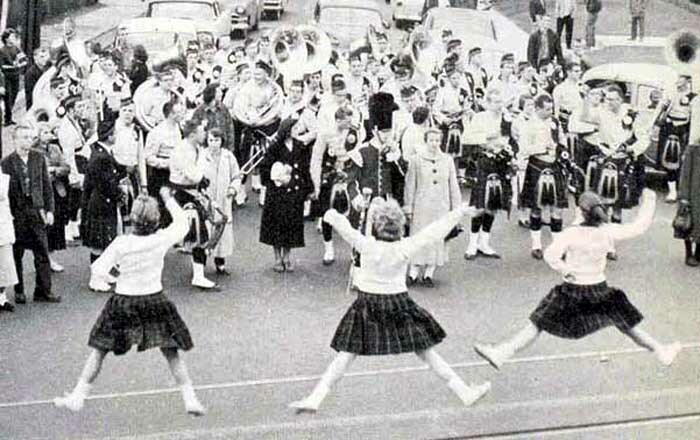 Out of their love and respect for Andrew Carnegie, the Tech band men were wearing Scottish costume. 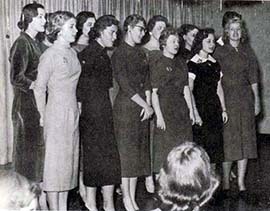 There were no women in the band during my period (1954-58). Scottish Gentlemen. 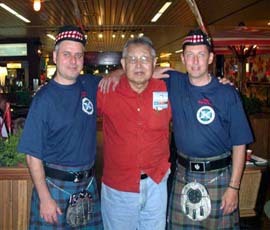 While I was waiting for a KLM flight to Saint Petersburg in August of 2003, I spotted these two gentlemen and told them why I like their costume. One of them told me he came from Carnegie's hometown in Scotland. They were on their routine business trip. 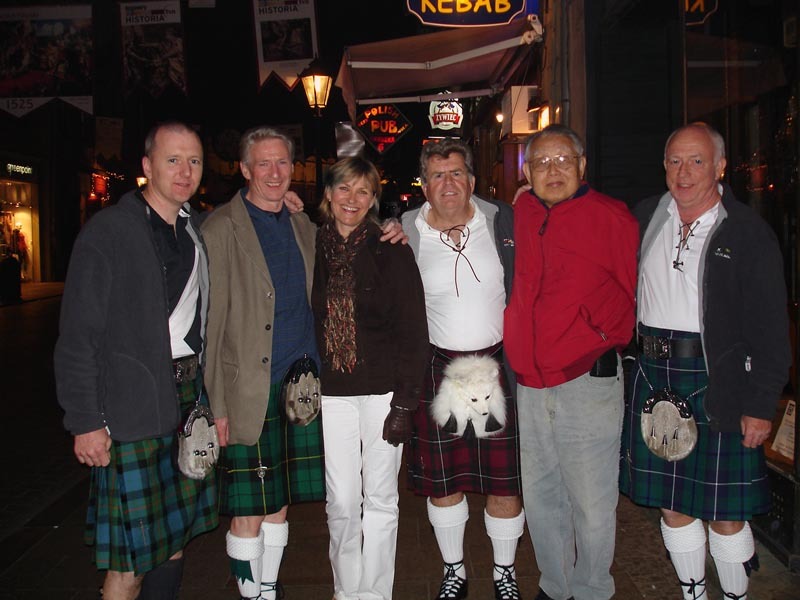 Another Group from Scotland. I met these people in Krakow (Poland 2007). My Einstein Page. 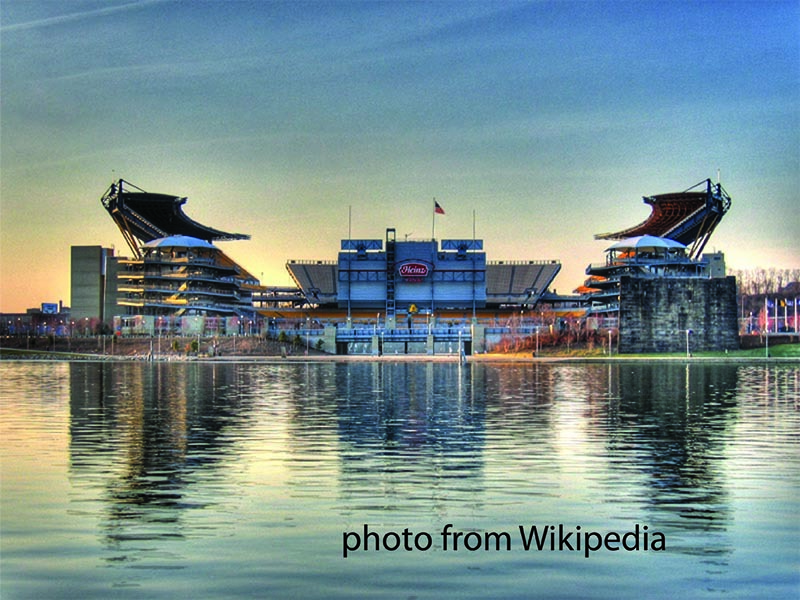 What have I accomplished since I came to Pittsburgh after my high school graduation in 1954? 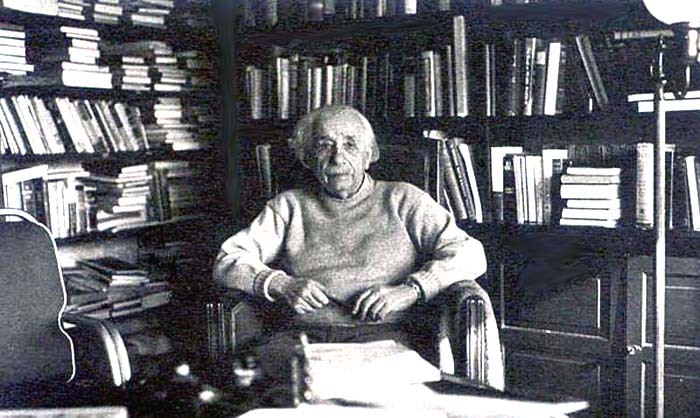 Einstein in 1954. Photo taken by Alan Richards (courtesy of the Institute of Advanced Study). Einstein left us in 1955. Einstein's First Visit to the United States in 1921. Einstein Photos. Let us look at them. I like to talk about Pittsburgh! KDKA. 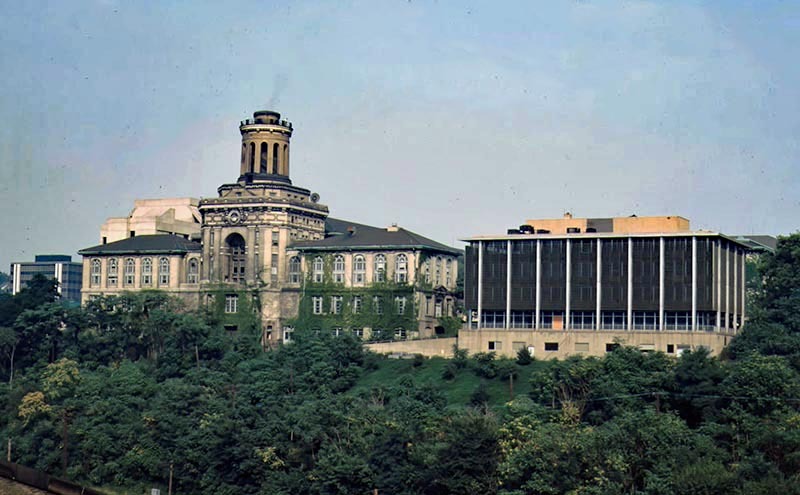 Pittsburgh's KDKA was the first radio broadcasting station in the world and covered the 1920 presidential election. Dashen-Frautchi Fiasco. After receiving my PhD degree in 1961, I had been struggling to find out the direction in my research life. After straightening up the confusion in the physics community in 1965, commonly known as the Dashen-Frautschi fiasco, I was able to construct my own research line. I was able to do this only because Carnegie Tech gave me a solid base in physics research. Carnegie Tech Cyclotron and Dirac's polarized neutrinos. Who is responsible for this webpage? Click here for his home page, or click here for his style page. copyright@2015 by Y. S. Kim, unless otherwise specified. Some of the black-white photos are from the Carnegie-Tech Year Book 1958.